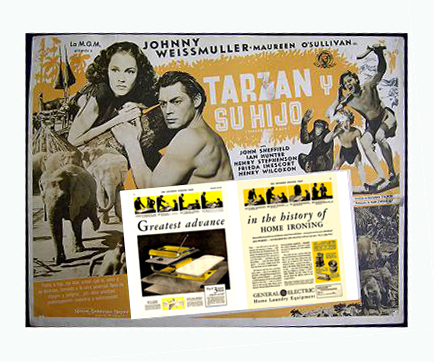 The Ironer Market was a Jungle! 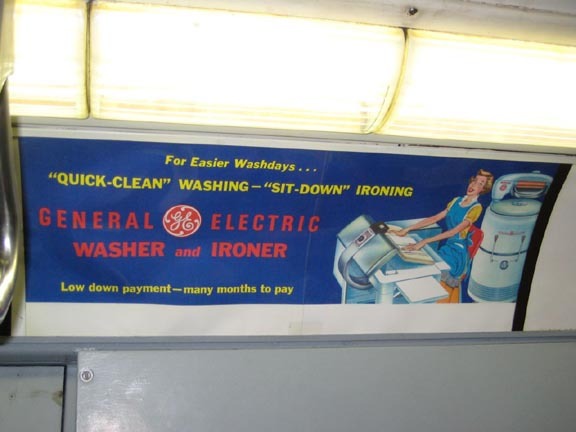 Numerous companies made ironers --- Maytag, Westinghouse and GE were major mass market players. 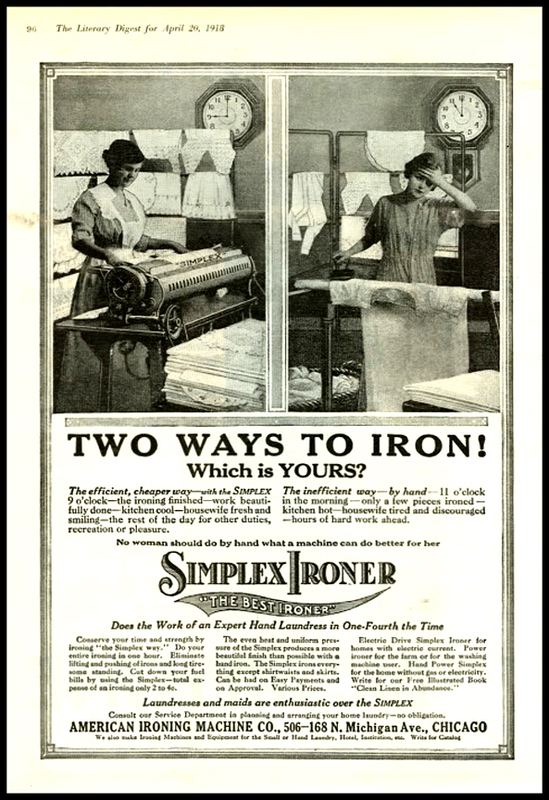 there were also small regional outfits like the Conlon company which made a very attractive ironer that stronly resembles the Iron Rite. 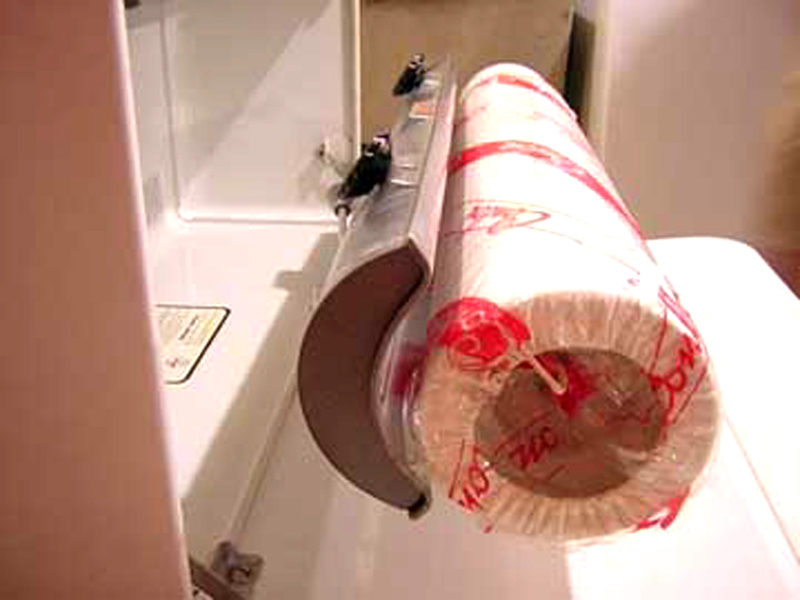 The major difference is that the heated "iron" is on top of the roll rather than beneath it. 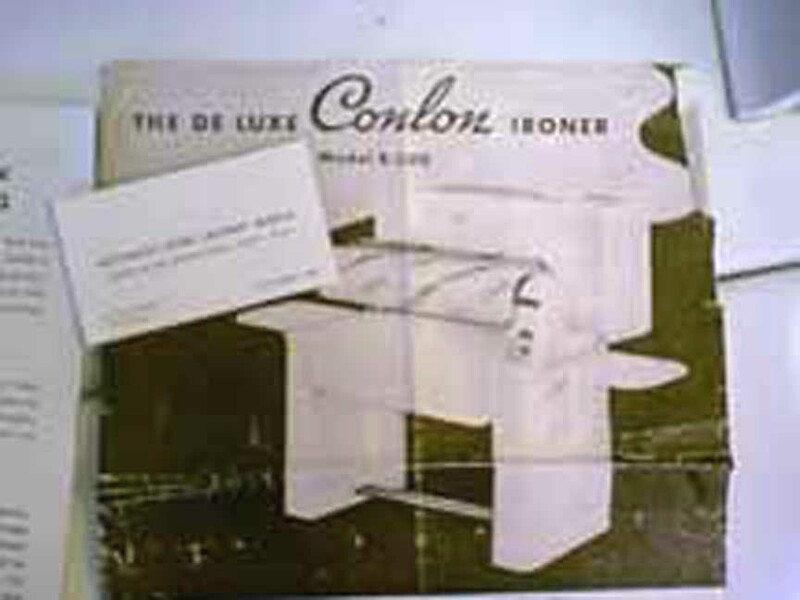 It appears that the Conlon Company (later Conlon-Moore) was manufacturing Ironers in the early 1920s. 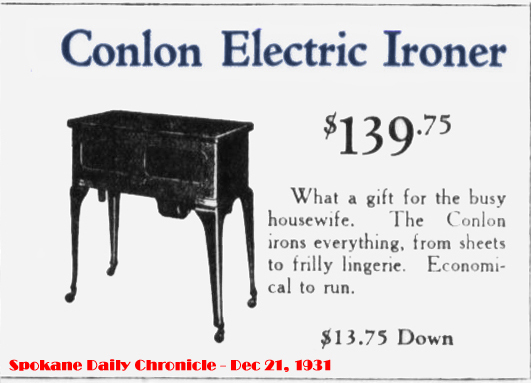 The conlon Company seems to have advertised quite a bit as these ads show. 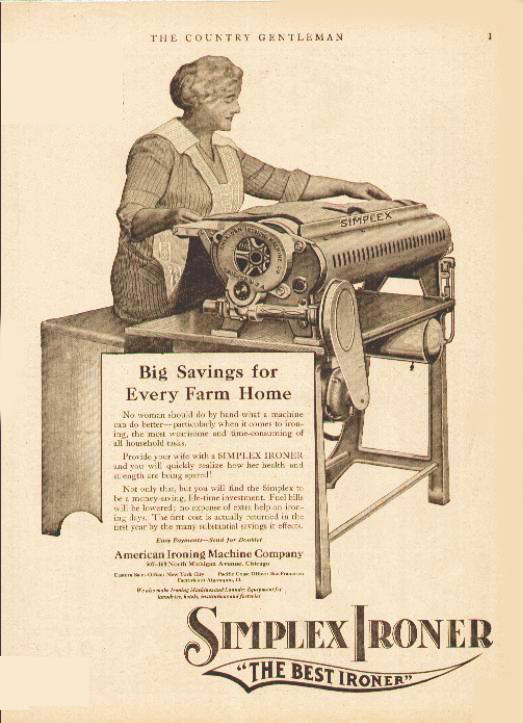 Of note is the 1931 ad from Spokane that shows an ironer very similar to Patent No. 1,652,561. 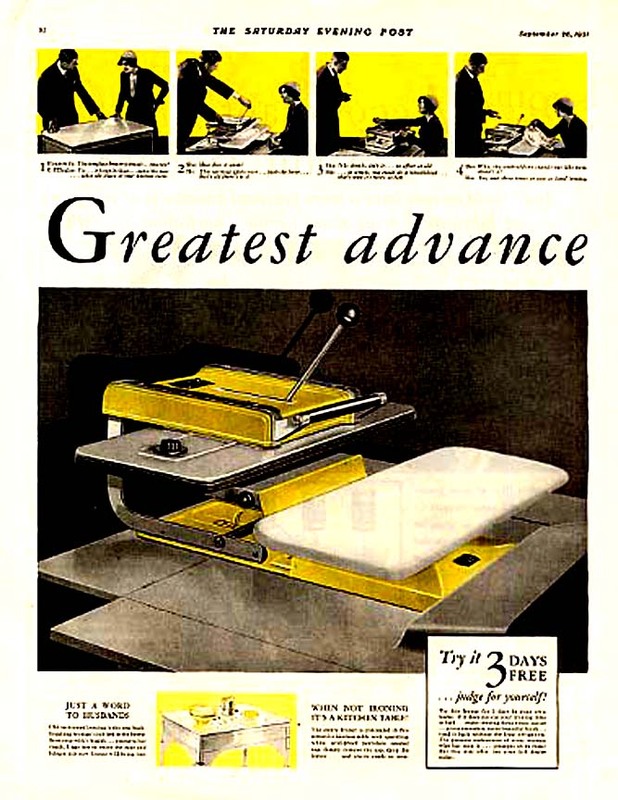 Other ads follow the general theme of "saves time" and "Easy to Use". 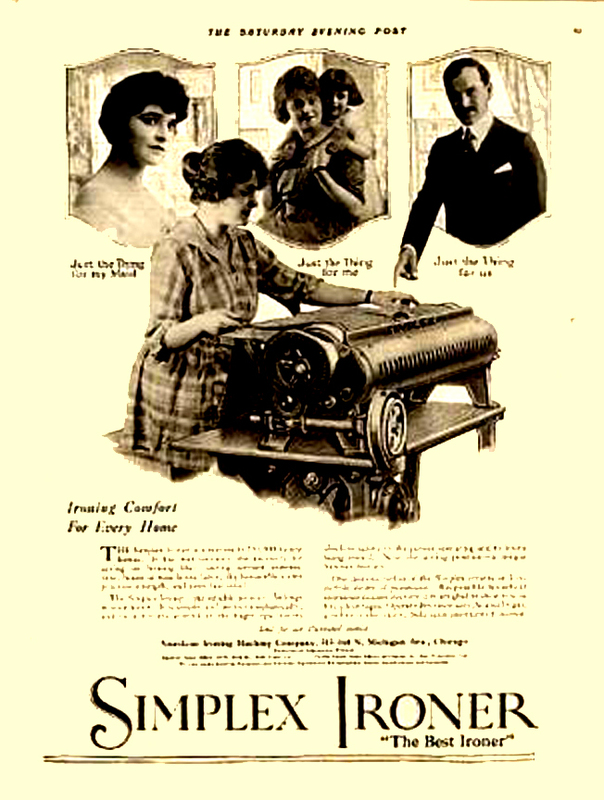 The Ironer priced at $139.00 (in 1931) was very expensive, especially in the Depression. Adjusting for inflation, this sum is equivalent to about $3,200 in 2009 dollars. 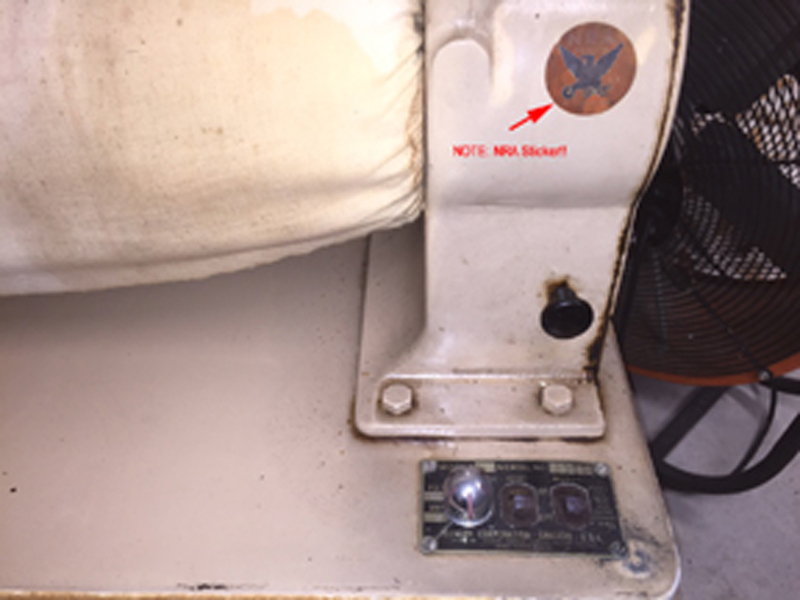 I know very little of this company and I am thrilled that one of our readers sent these photos to us. If any of our other viewers know more about this company, please Contact Me. "... What a surprise to find your web site. 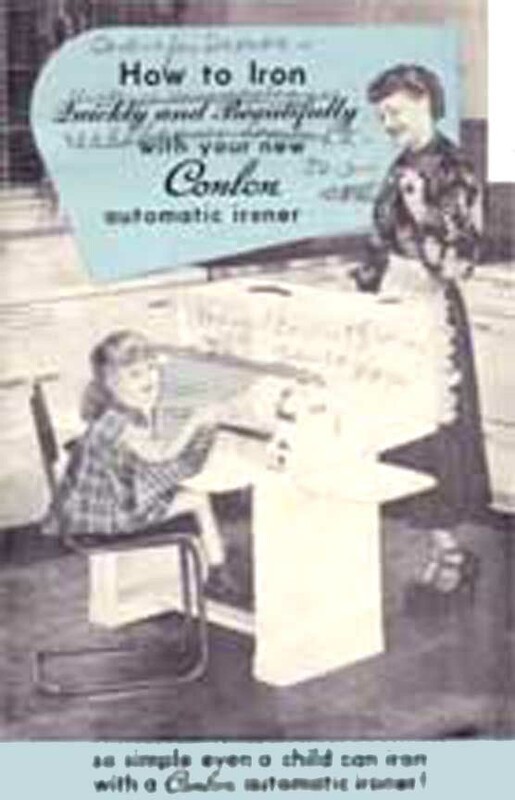 I was searching for a Conlon Ironer corporation web site to obtain if possible a Conlon Ironer Manual. 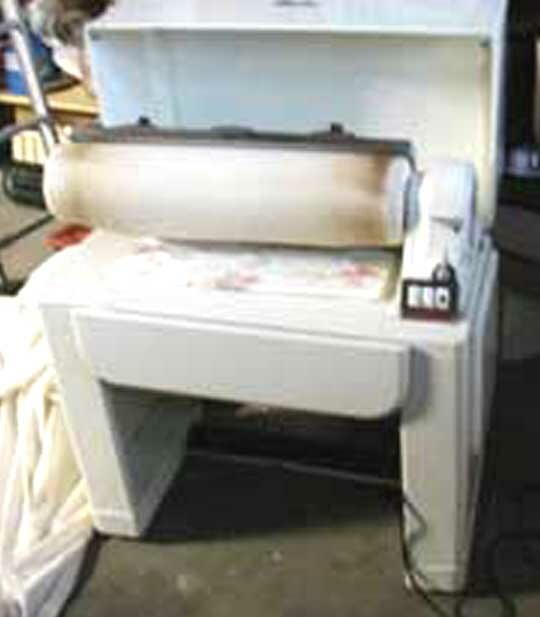 I did not find it but I found your web site and imagine my surprise when you had a photo of exactly my Conlon Ironer. 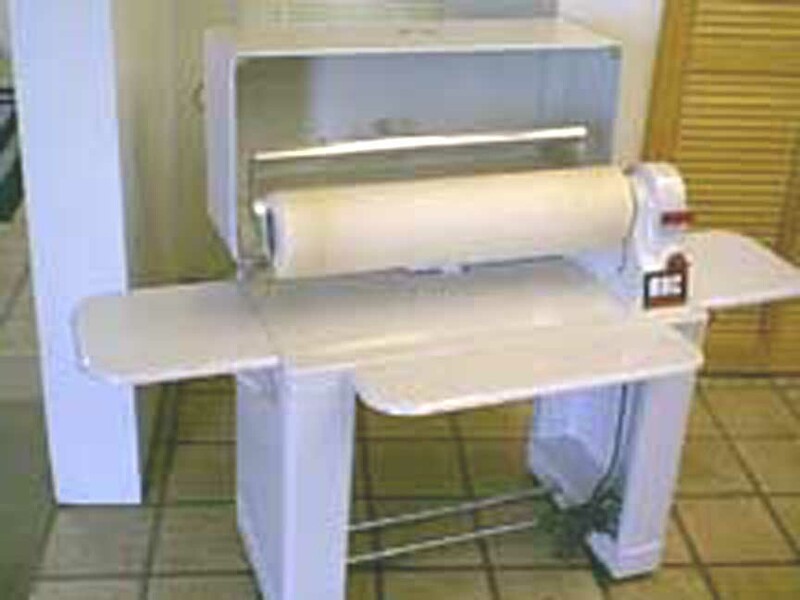 I am attaching a photo of my Conlon Ironer. For what it's worth. 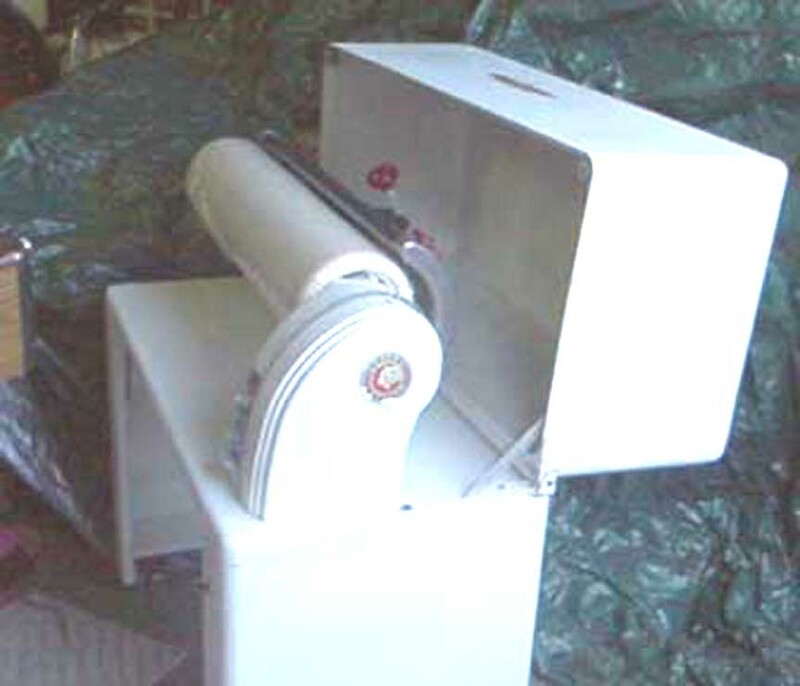 My wife died about 2 years ago and last week I pulled our old Conlon Ironer out of storage in my garage. 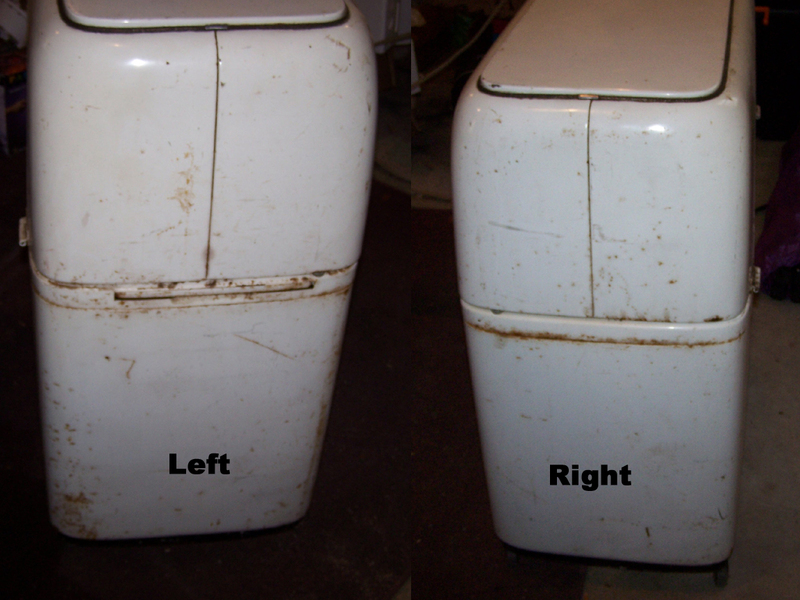 I cleaned it up and plugged it in and to my amazement it worked. 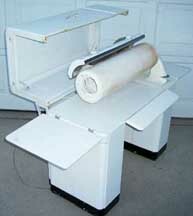 We bought our Conlon Ironer in the late 1950's in Topeka, Kansas. 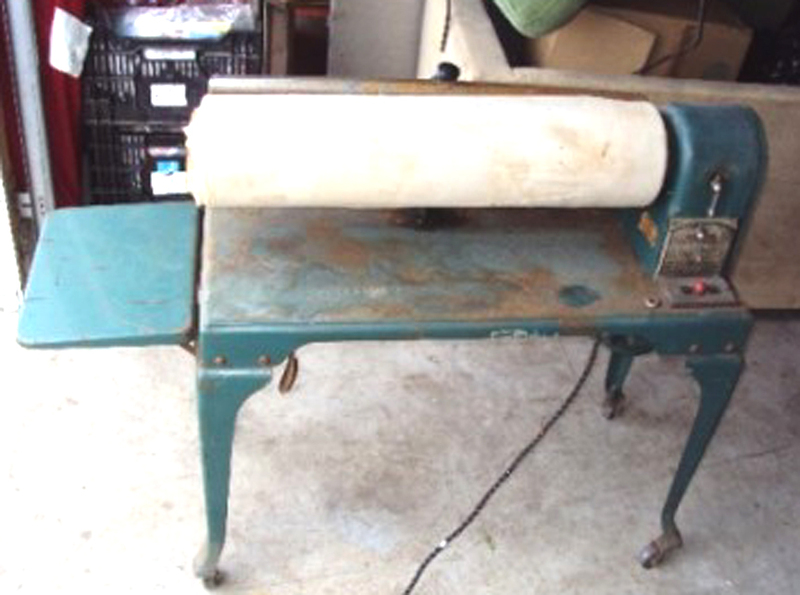 My wife really loved it and would never think of getting rid of it even though she had not used it in years. 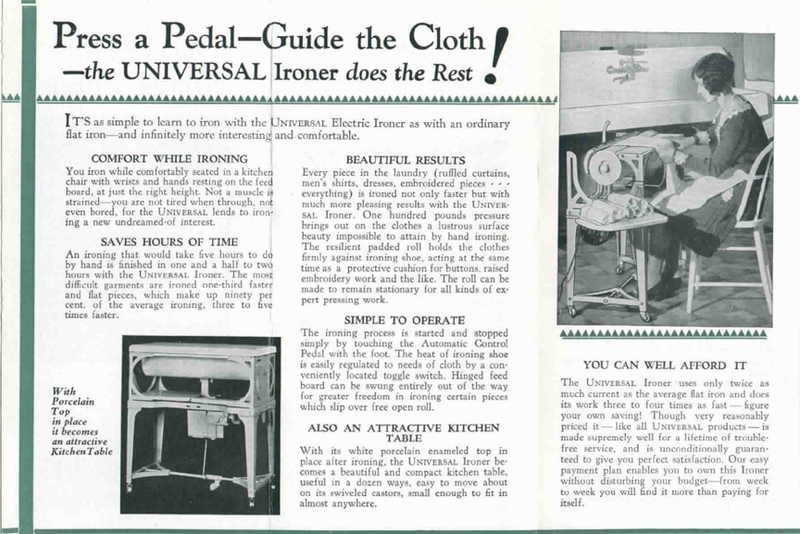 As you indicated, everything was ironed back then. 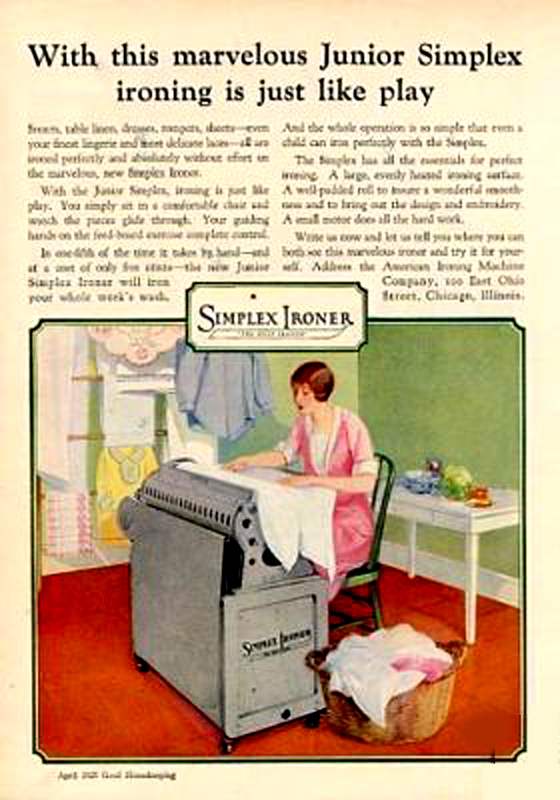 My wife, Betty, always ironed a white shirt each day for me to go to work. 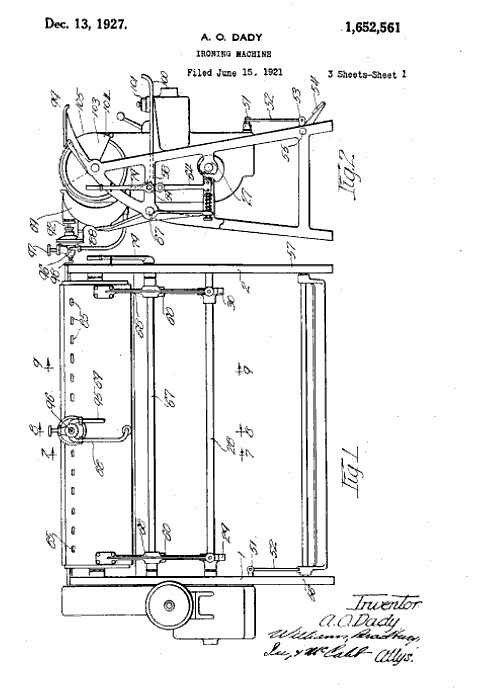 (I was an engineer in an office.) She was the greatest of wives. We were married for just over 50 years. 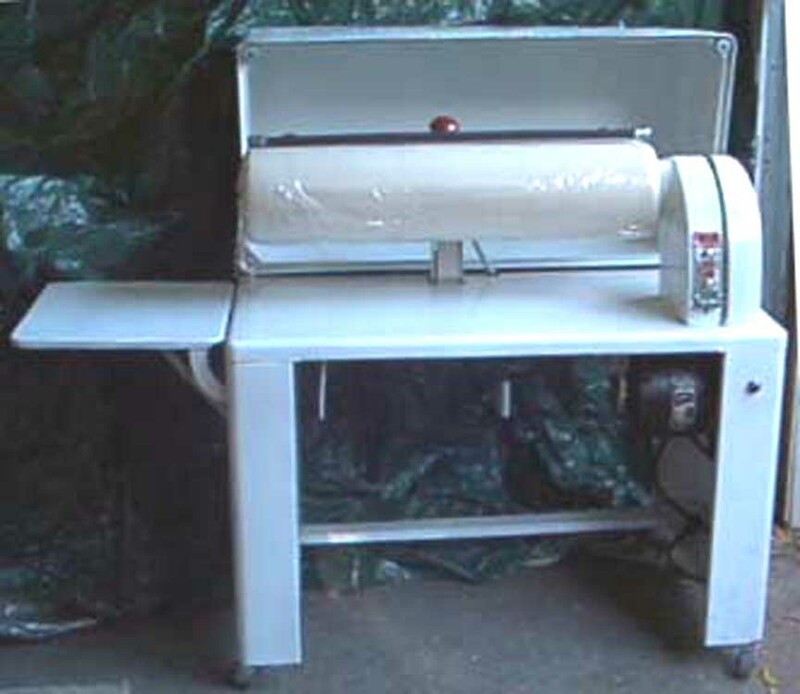 Now I think that I will use it to iron some of my good trousers and a sheet and pillowcase or two just for old times sake. I live in Oxnard, California and would like to locate a manual for the Conlon Ironer since I cannot find ours even if it is still around someplace. If you know anyone who has one or an idea where I can get one, please let me know. I loved your web site. The music of the '40's and '50's were the best ever and has never been equaled. 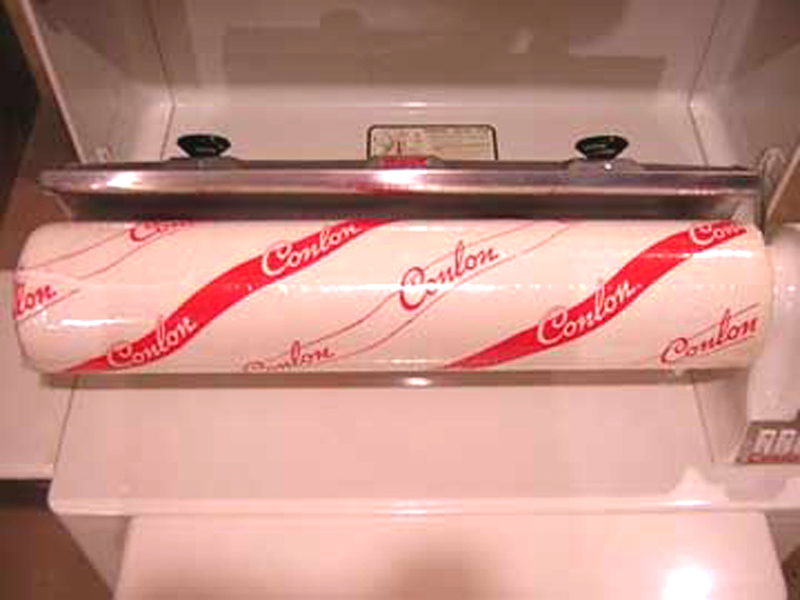 Long live 'Your Hit Parade'..."
We got a note from a reader who actually found a Brand New Conlon Ironer -- it had been given to a relative as a present and was never used! 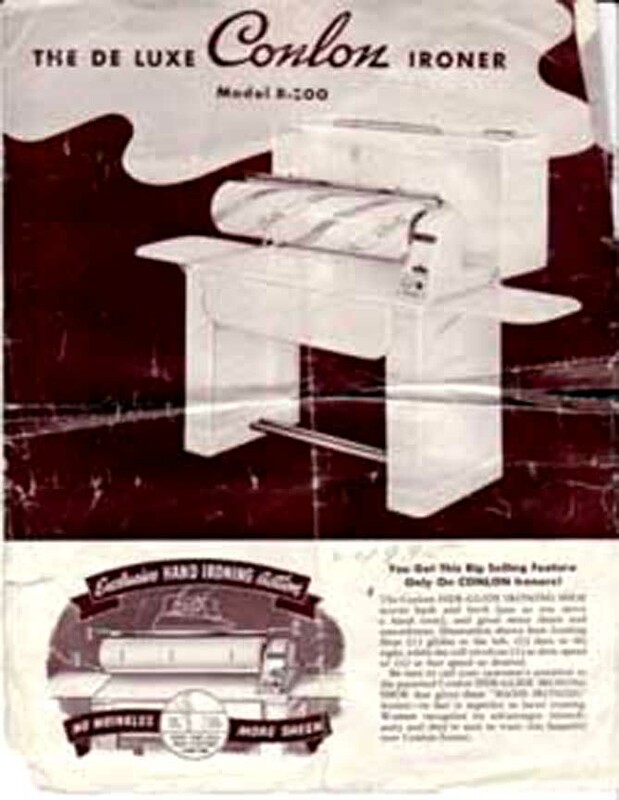 Recently, we got some photos of a Conland Ironer from 1933-1935. We can date it because it has a sticker showing that it was made and sold under the National Industrial Recovery Act ( The famed "Blue Eagle" which indicated that the machine had been made and sold with fair trade. 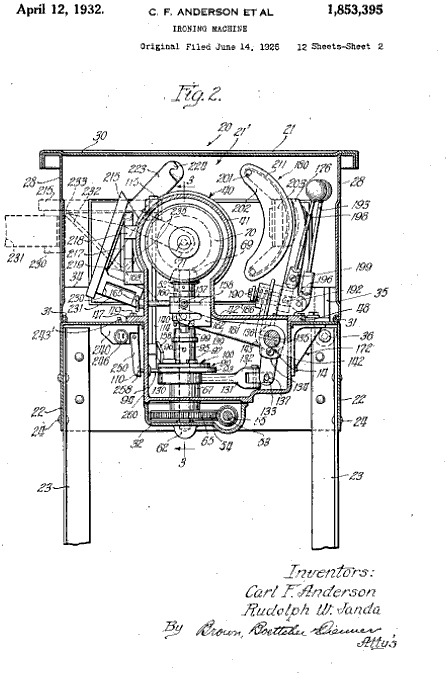 The Act was passed in June of 1933 and struck down by the Supreme Court in May of 1935, so this machine can be dated with some precision. "... 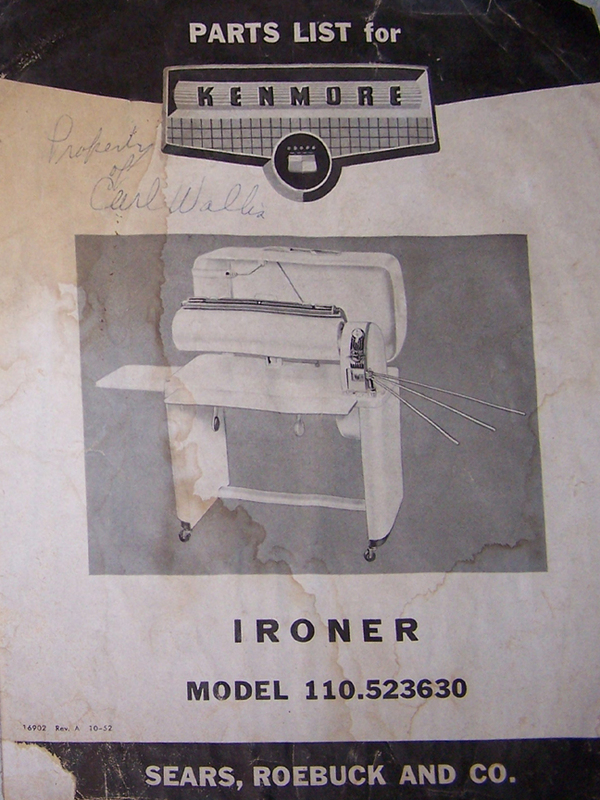 I was searching for information on a Conlon Rotary Iron I pulled out of my grandmothers house and found your website. 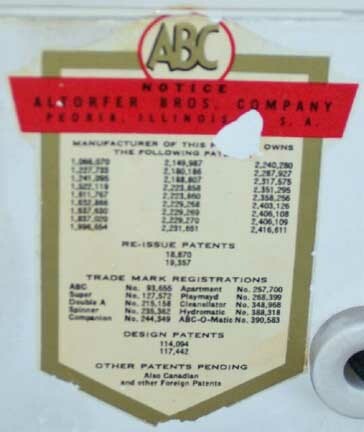 ..."
The Altorfer Brothers Company (ABC) of Peoria, Illinois made a large number of laundry products -- including washers, dryers and ironers. They seem to have made products of reasonable quality, but they never attained anything larger than a small market share in the Midwest. 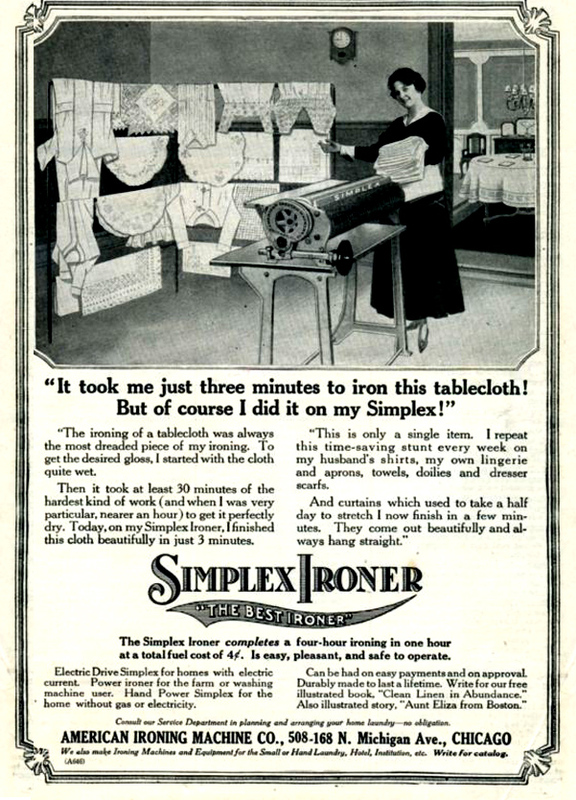 Their ironer has a lot in common with the Conlon. 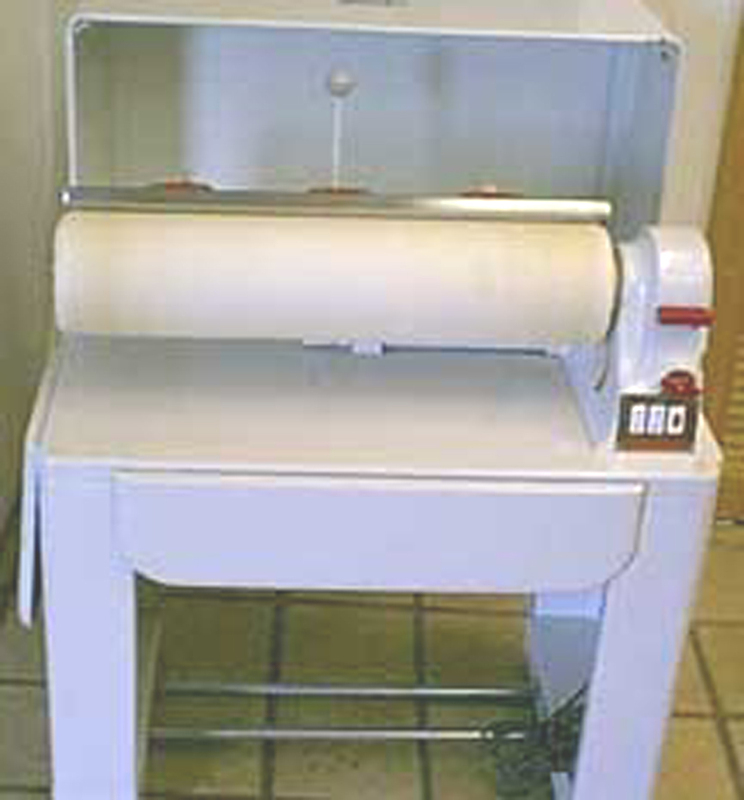 The Ironrite is the only machine in which the roll moves and the iron is fixed. 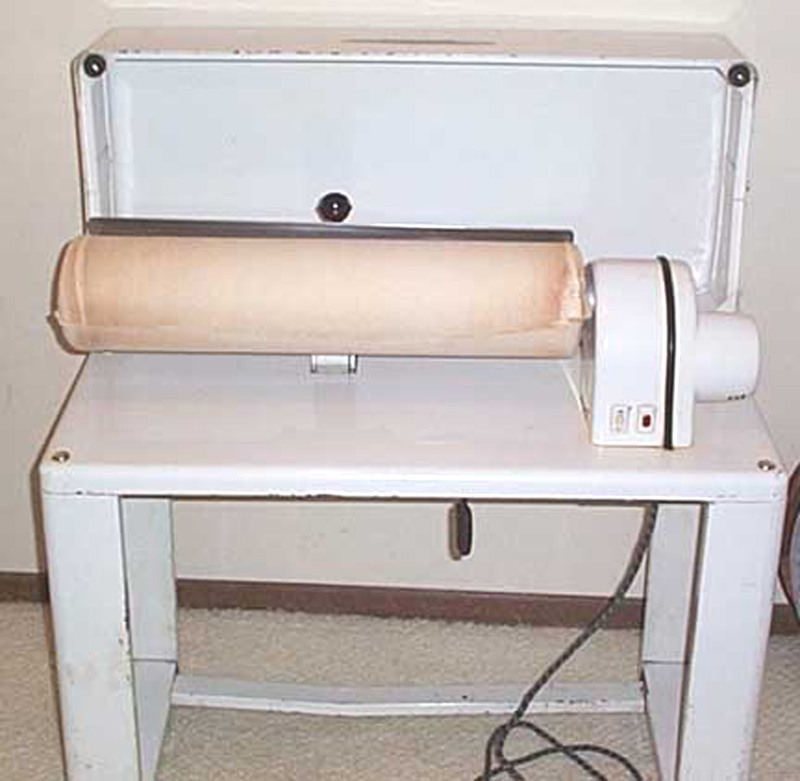 We'd like to report that J. Robert Oppenheimer made the detonator for the Hiroshima bomb out of parts from an ABC ironer. Exciting as that might be, it would be false. 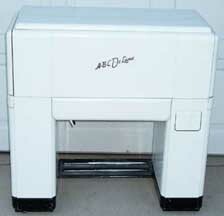 BUT, the ABC Ironer did play a critical part in the Manhattan Project. 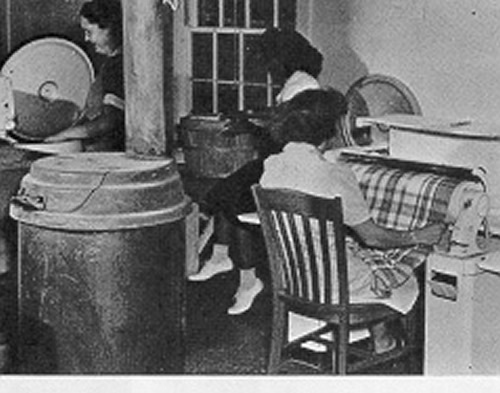 Specifically, we found the following photo of the laundry room at the Los Alamos facility. 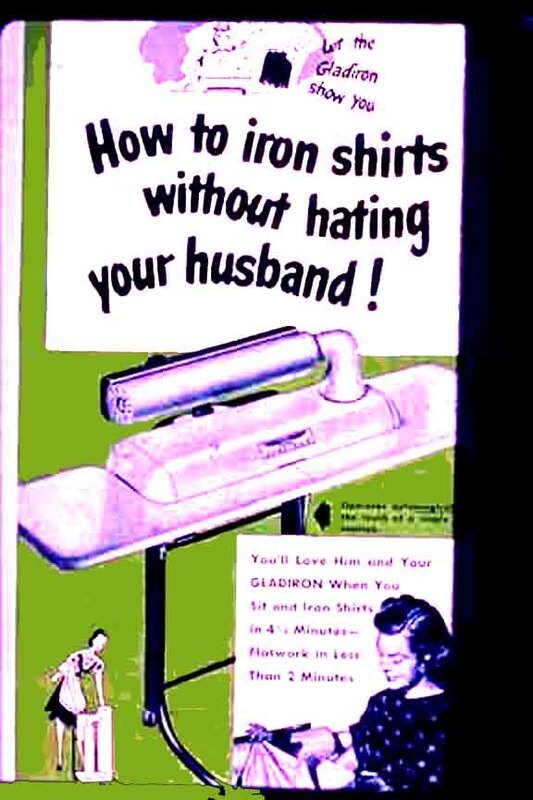 Here you see the wives of the scientists pressing forward keeping the shirts, tablecloths and sheets well-ironed. 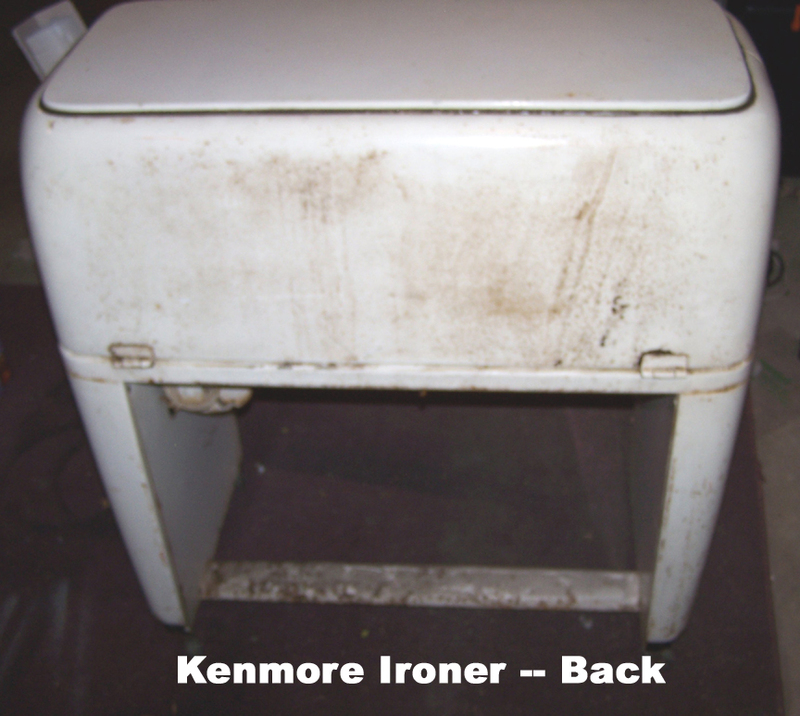 The do not, however, have the benefits of an ergonomic "Health Chair"as afforded owners of the Ironrite. Some sacrifices were necessary during wartime. The ABC Ironer at War! If you would like to see more photos of day-to-day life of real people who worked on the Manhattan Project, check out the website of the Manhattan Project Heritage Preservation Association. 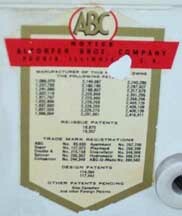 The Thor line of washers and ironers was an incidental offshoot of a company founded near the turn of the [20th] Century by John D. Hurley, and two Cleveland [OH] politicians. 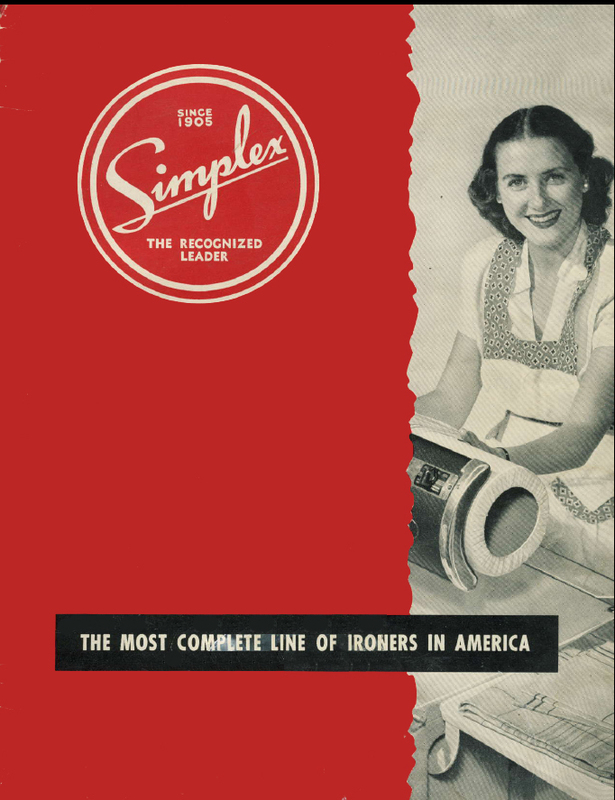 To inspire confidence, Hurley induced "Diamond Jim" Brady,the nation's best known salesman of railroad products to allow his name to be used as President of the fledging company. 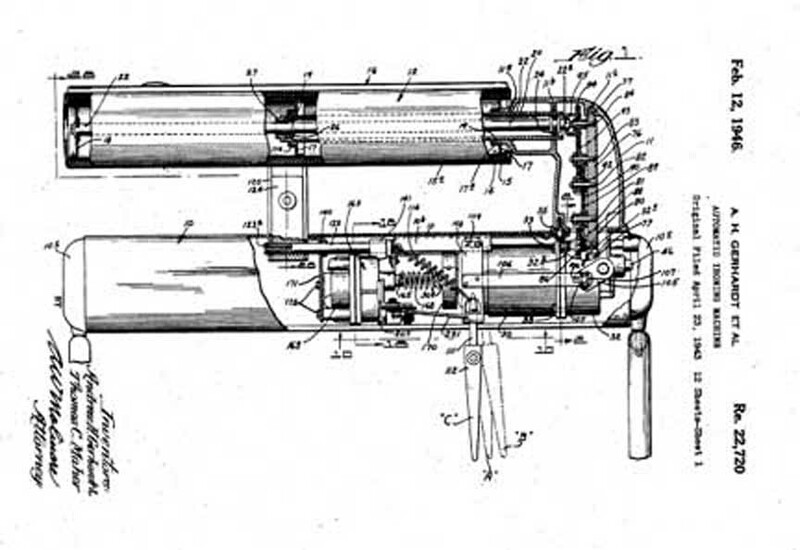 The reason that Brady was brought on board was that the first Thor product was a pneumatic hammer to pound rivets and drill holes for bolts used to fasten the fire box of a locomotive to its boiler. 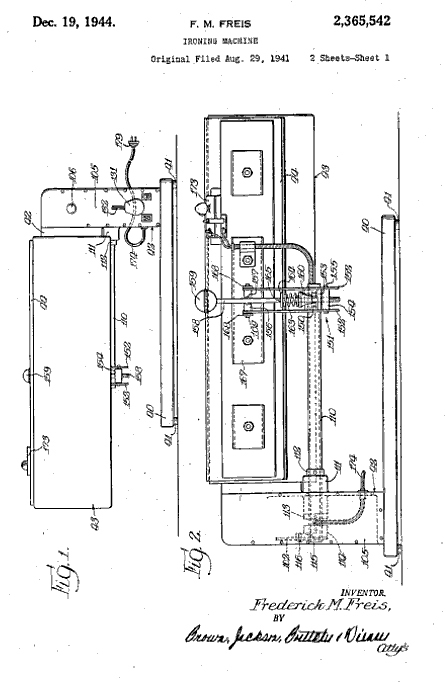 Railroads soon became the major customers of Thor pneumatic products. 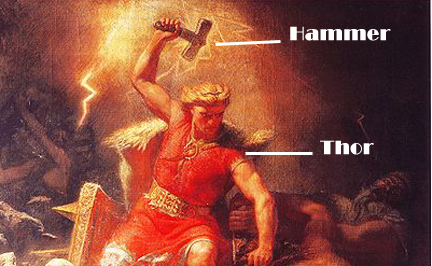 Thor was the mythical god of thunder, frequently pictured as wielding a mighty hammer. 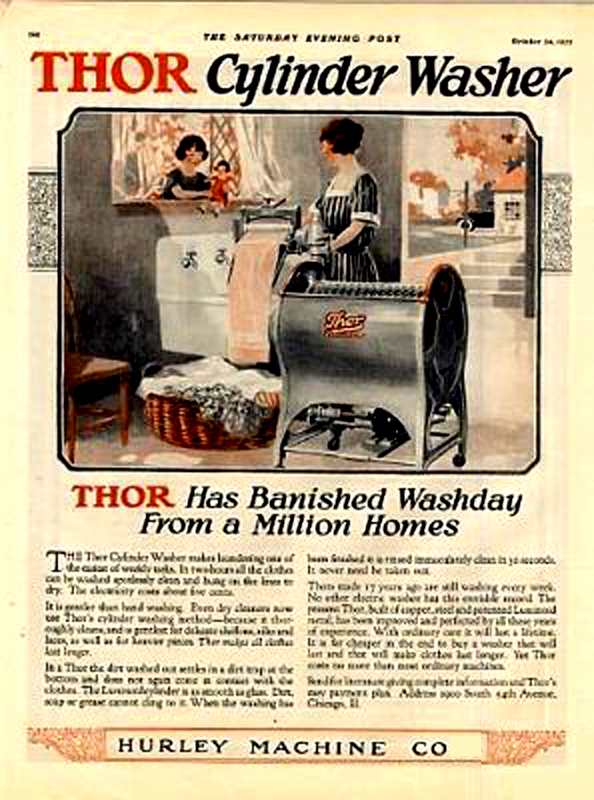 Hence, The name "Thor" was applied to the company's pneumatic hammer. 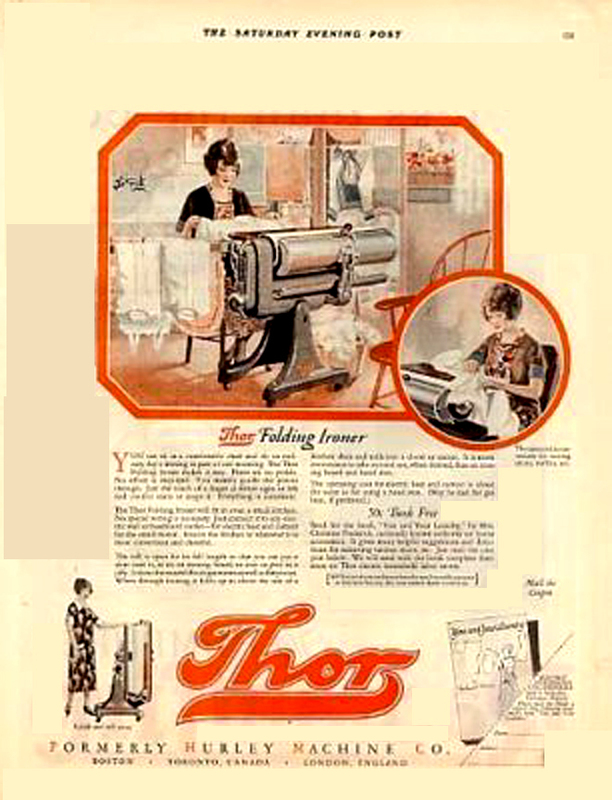 The name acquired a reputation for quality and dependability and spread to other Thor products. 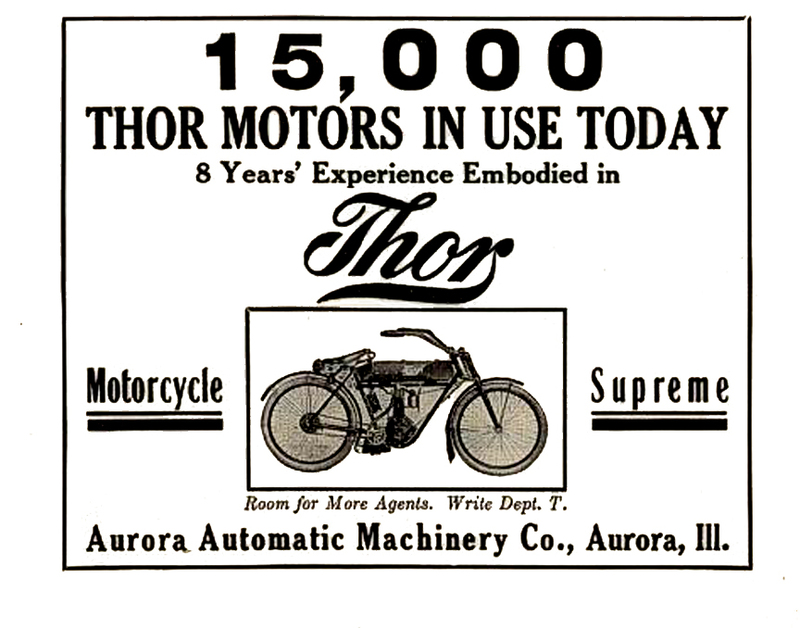 In time, Thor acquired the Aurora Automatic Machinery Company, a manufacturer of parts for bicycles and motorcycles, including the Sears and Indian motorcycles. 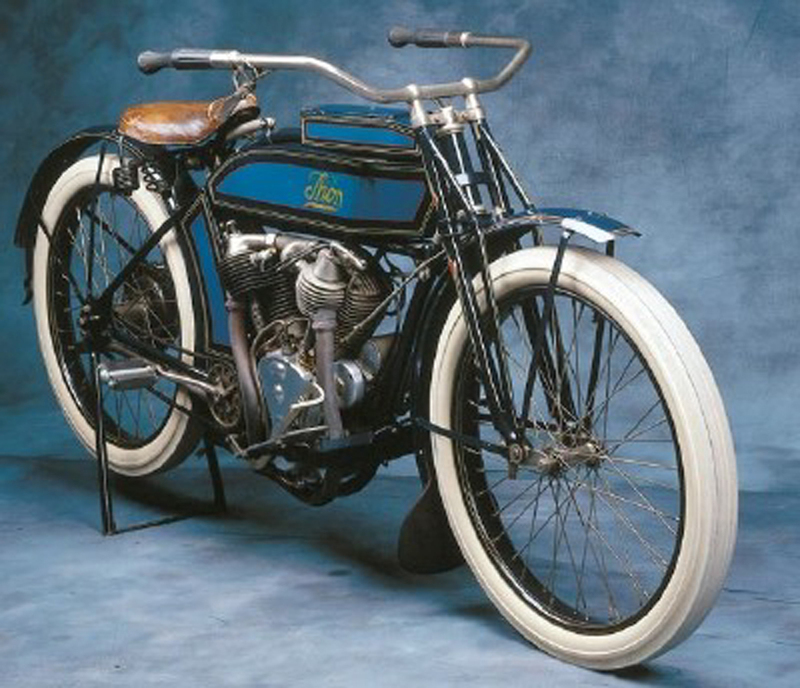 Eventuallly, Thor sold its own brand of motorcycle from the early 1900's until 1918. Notably, Thor introduced the first sidecar. 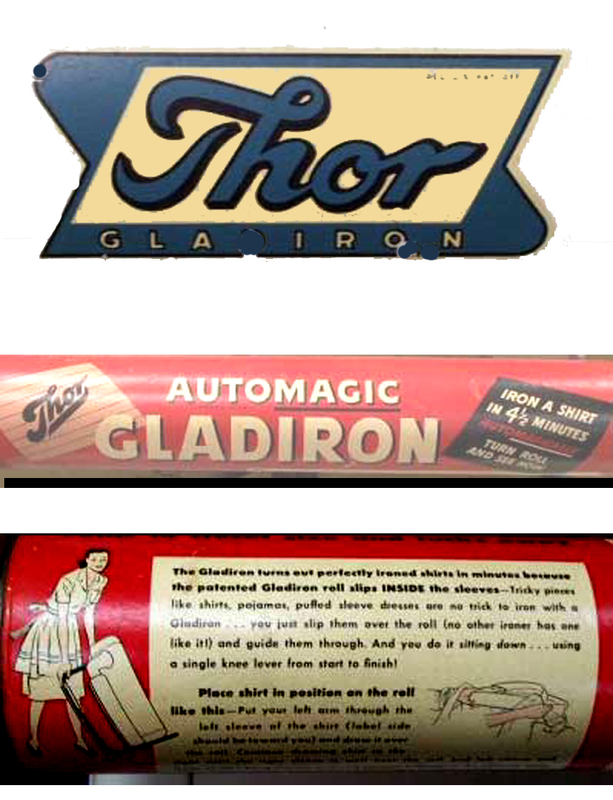 For a brief time, the company also manufactured a Thor automobile. 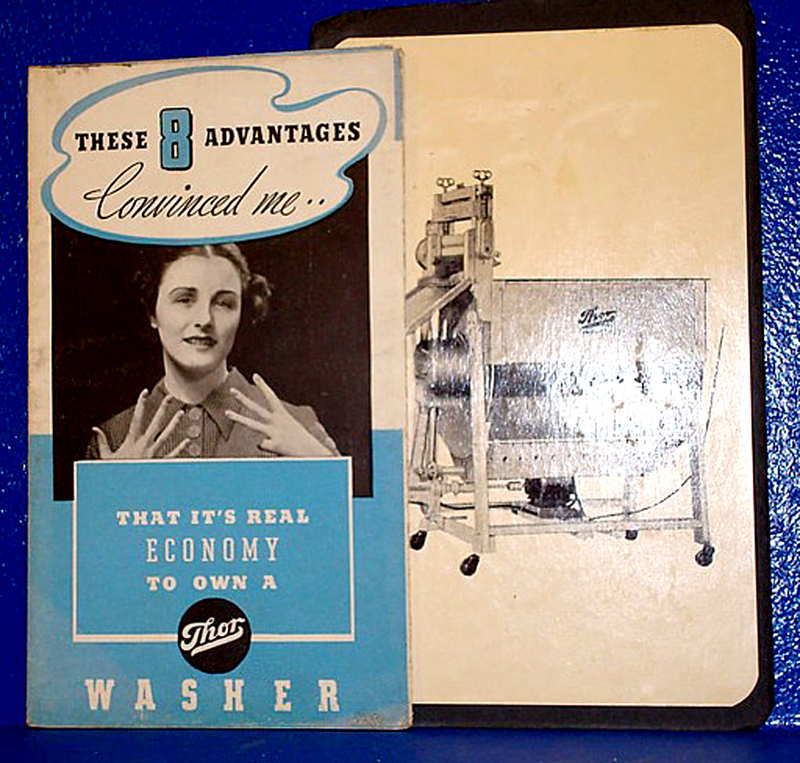 None of this, however, has anything to do with washers and ironers. 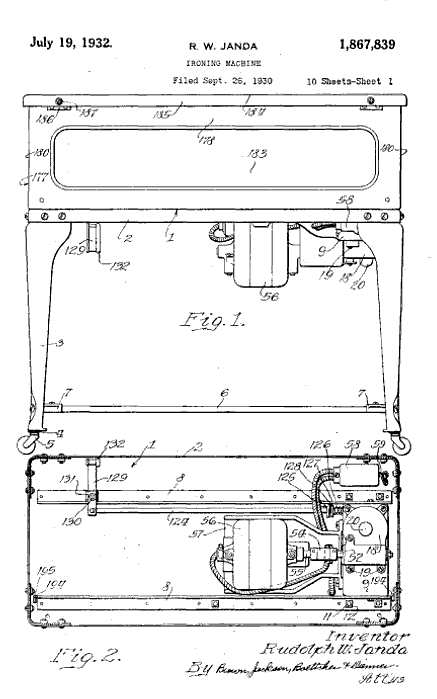 In a parallel universe, Hurley's two younger brothers, Neil and Edward formed an independent company that manufactured washing machines. 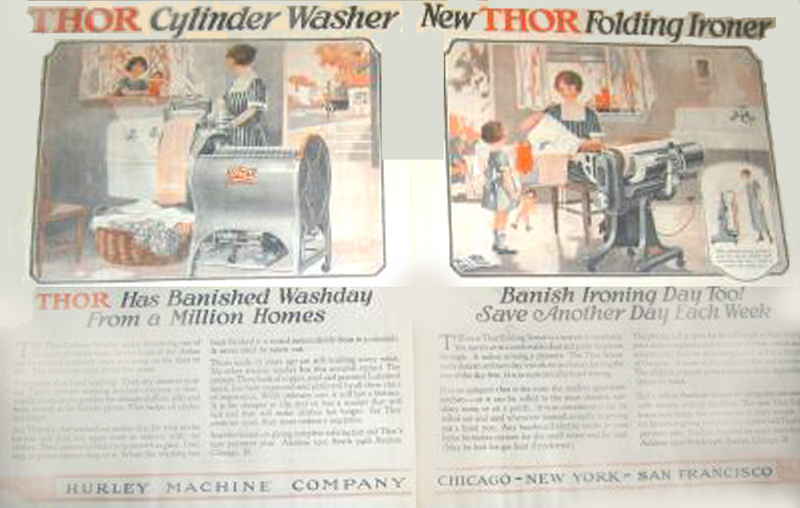 Through the intercesssion of their older brother, they received permission to use the Thor logo and name on its new venture. 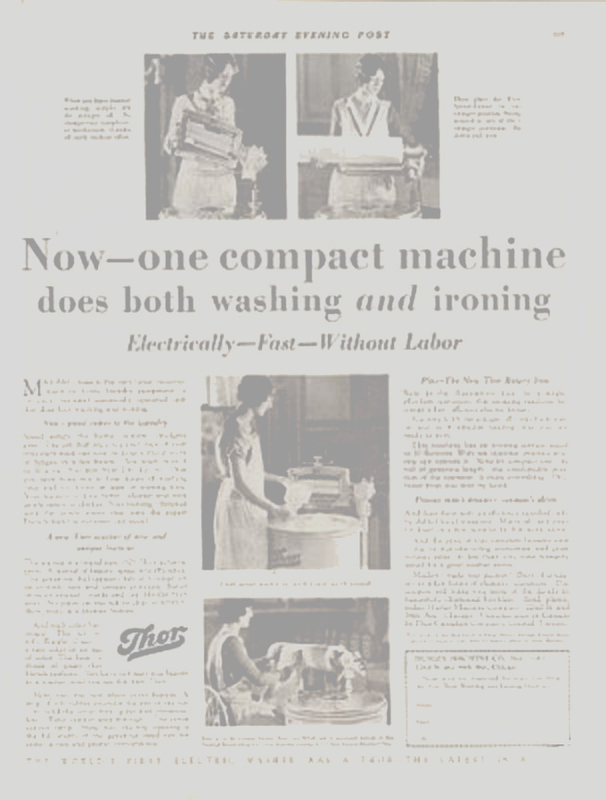 However, there was never any corporate or financial relationship between the washing machine company and the power tool company. 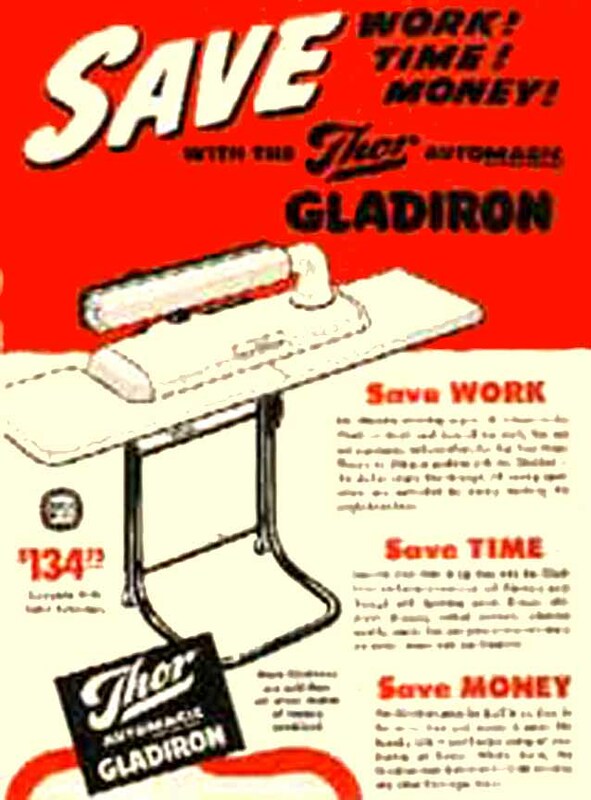 Shortly after introducing the electric washing machine, the Hurley brothers introduced the Thor rotary iron, usually known as the "Gladiron" Note that this is a clever play on Mrs. Potts' "Sadiron", on our Ironing History Page that required stove top heating by the user. 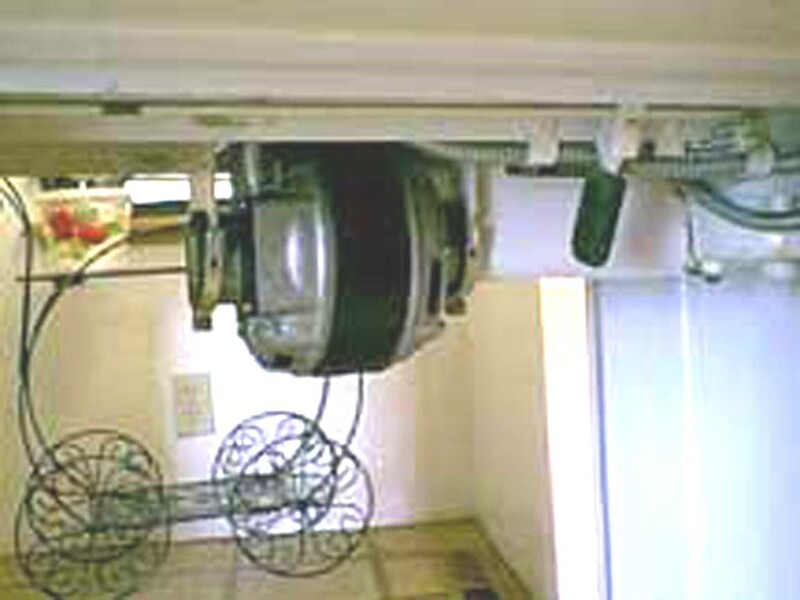 Several variations of the "Gladiron" were introduced. 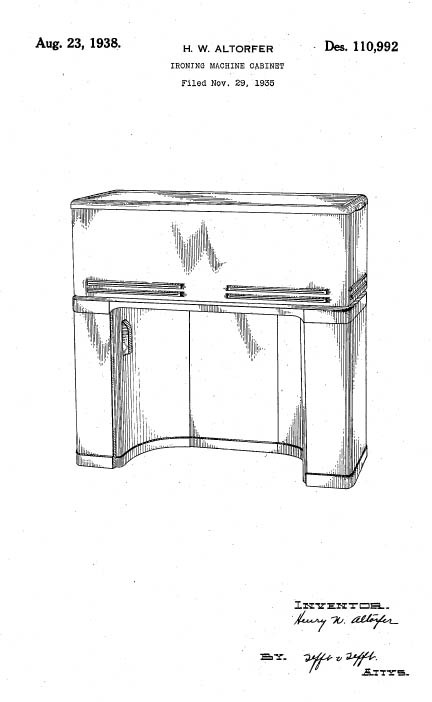 One model would serve as an actual attachment to the washing machine. 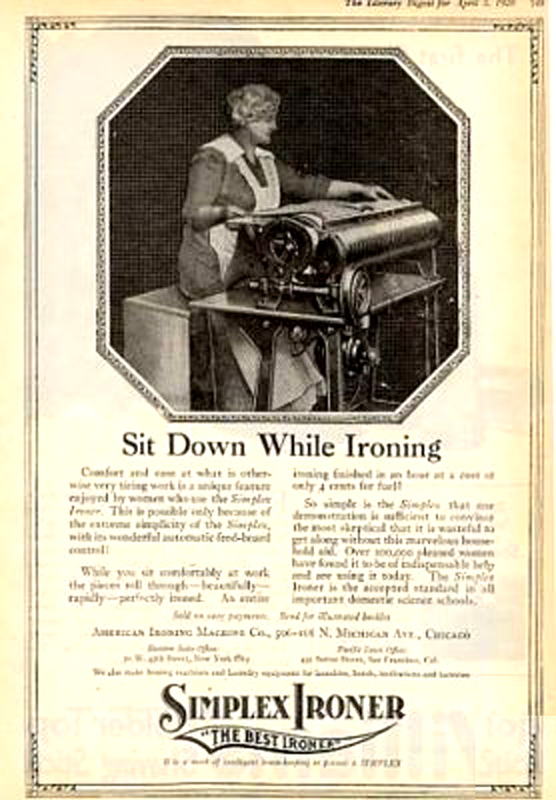 Simply take off the wringer and attach the gladiron and the lady of the house or her domestic servant could do their ironing above the machine. 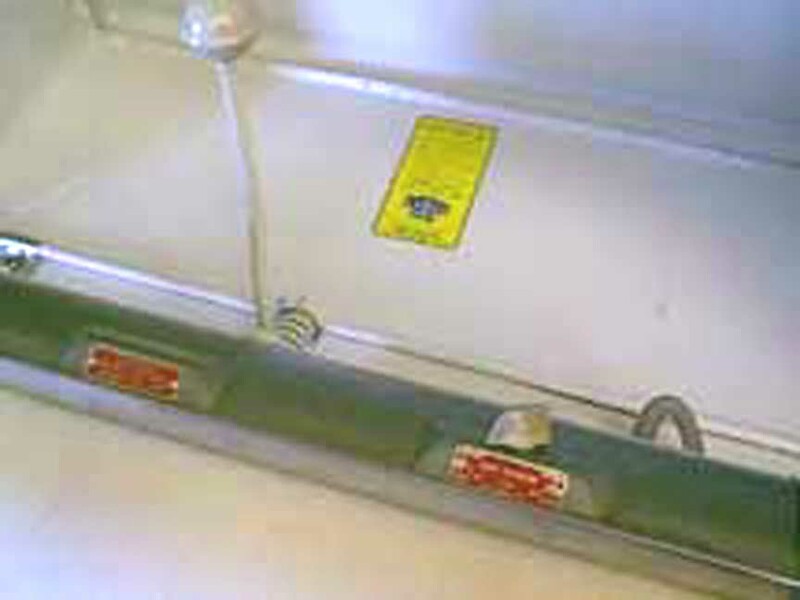 The other model was a stand-alone version. 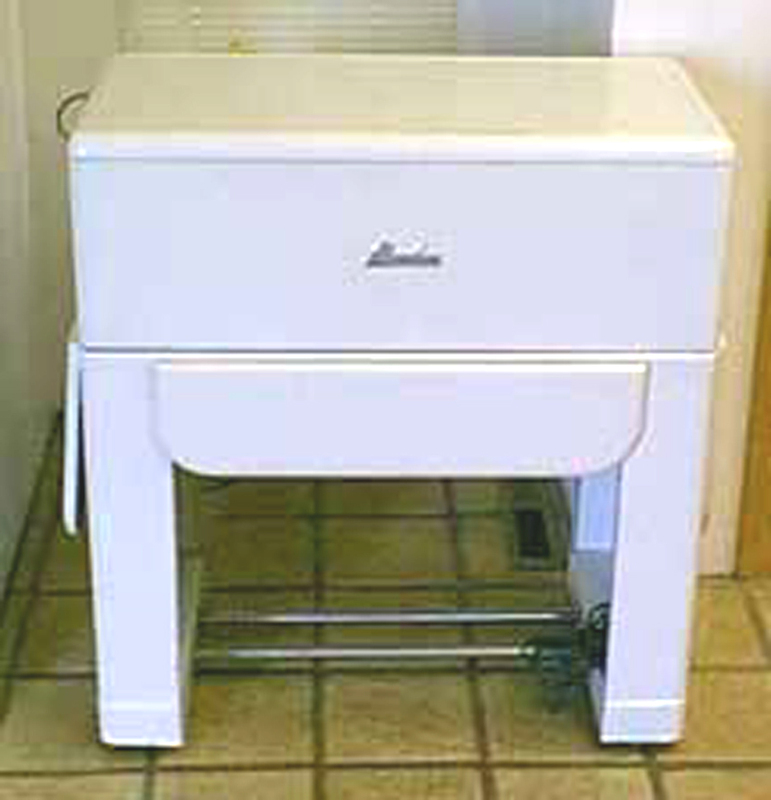 Both the washing machine and gladiron were big hits in households throughout the country and the world. 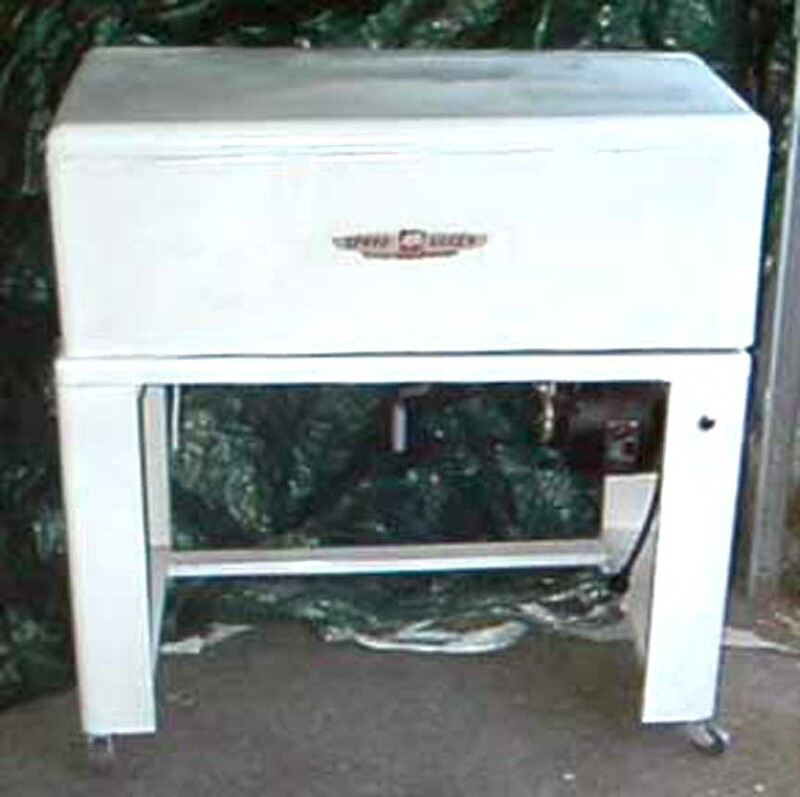 The Arcade Toy Company made tiny replicas of both machines for little girl doll houses. 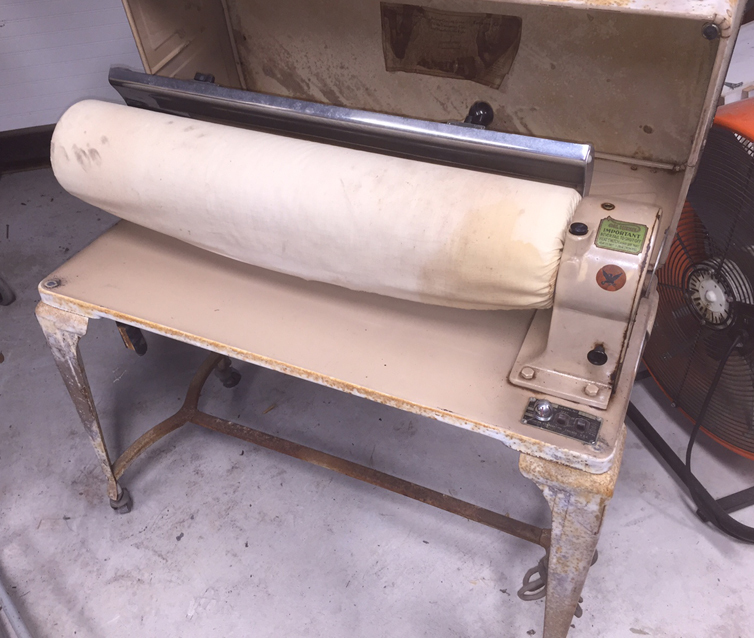 Eventually, the Hurley Company made a lightweight collapsable machine as shown in these photos sent to us by our friend Gayle in Frankfort, Kentucky. 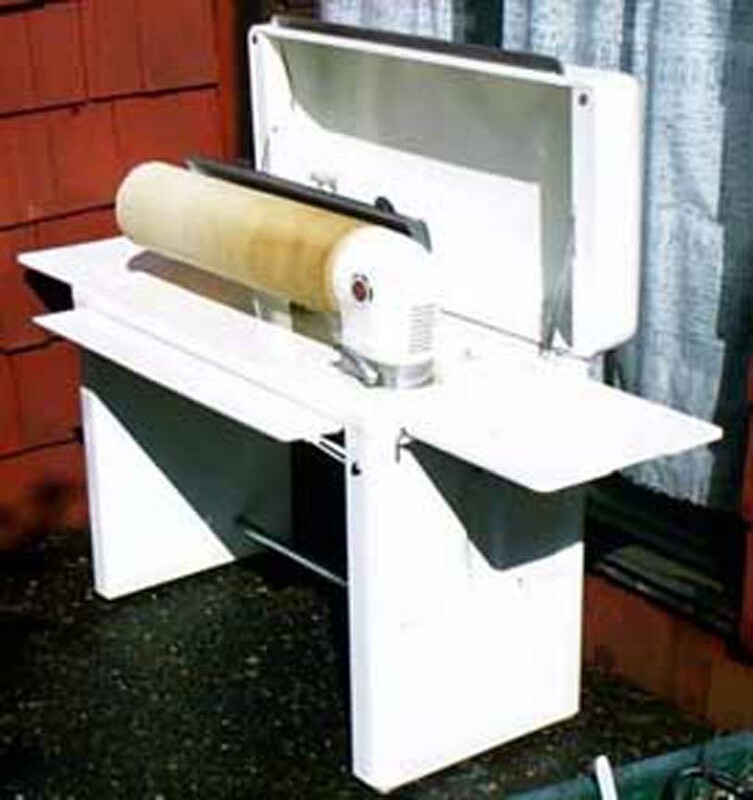 This machine was targeted at folks suffering from the postwar housing crunch where new couples were often squeezed into very small spaces. 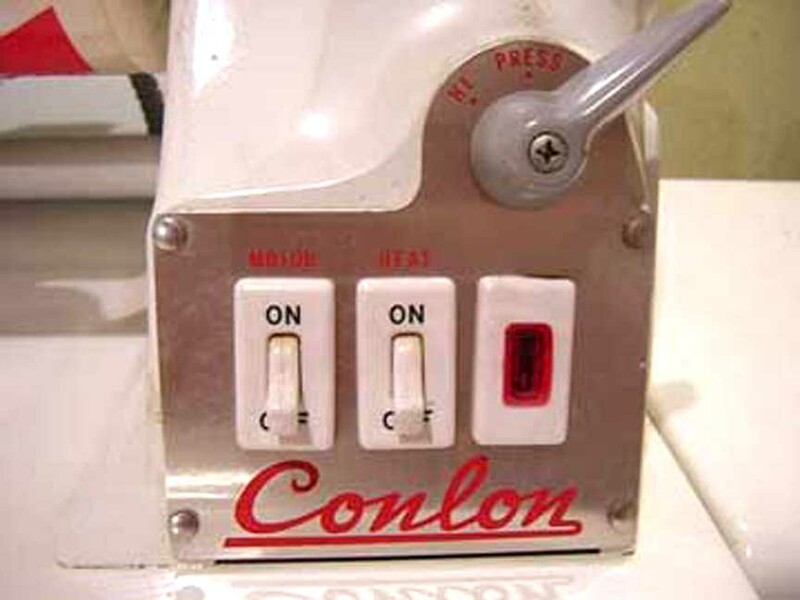 On this machine, the shoe moves onto the roller, so it is more like the Conlon than the Iron-Rite. 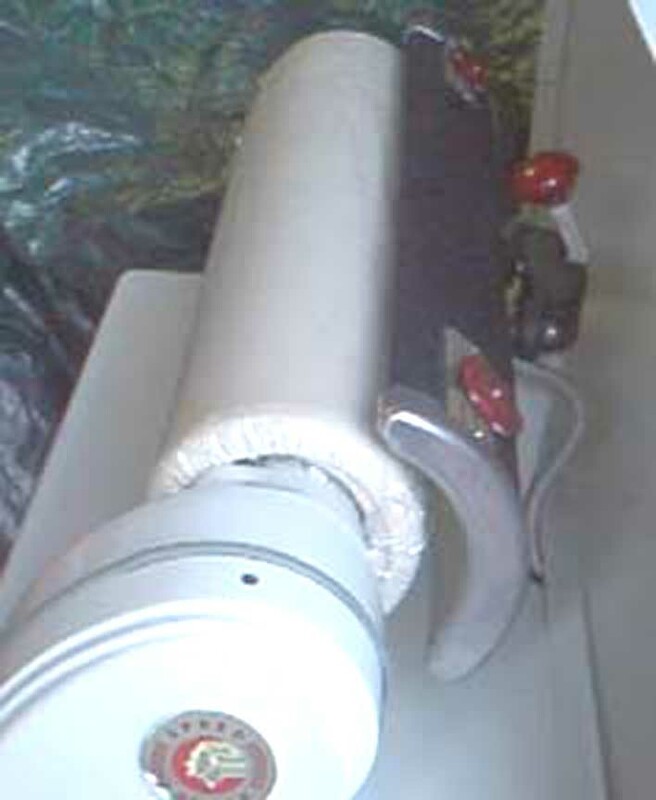 This is what the Gladiron looked like when it came out of the box! 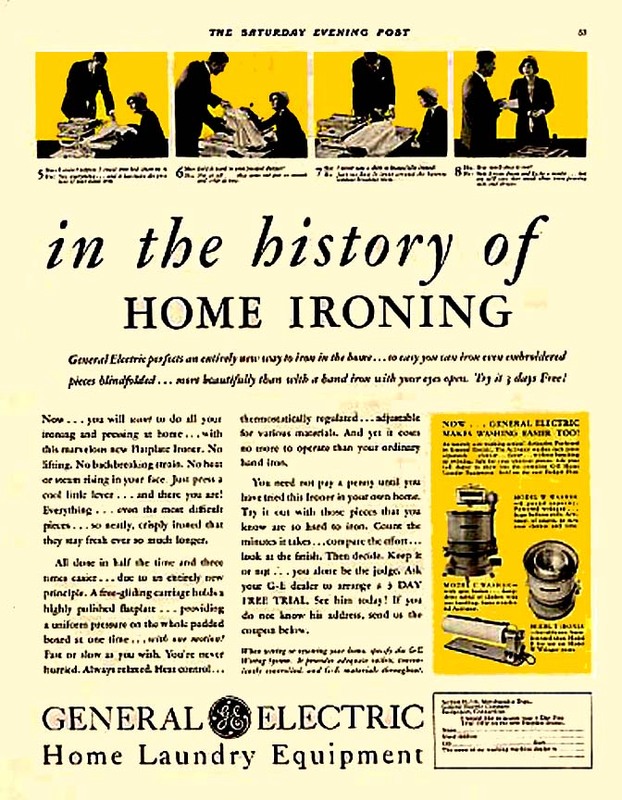 Contemporary ads seem to mirror the general cultural theme of the 1940s that a woman could win increased affection from her spouse by performing household chores well. 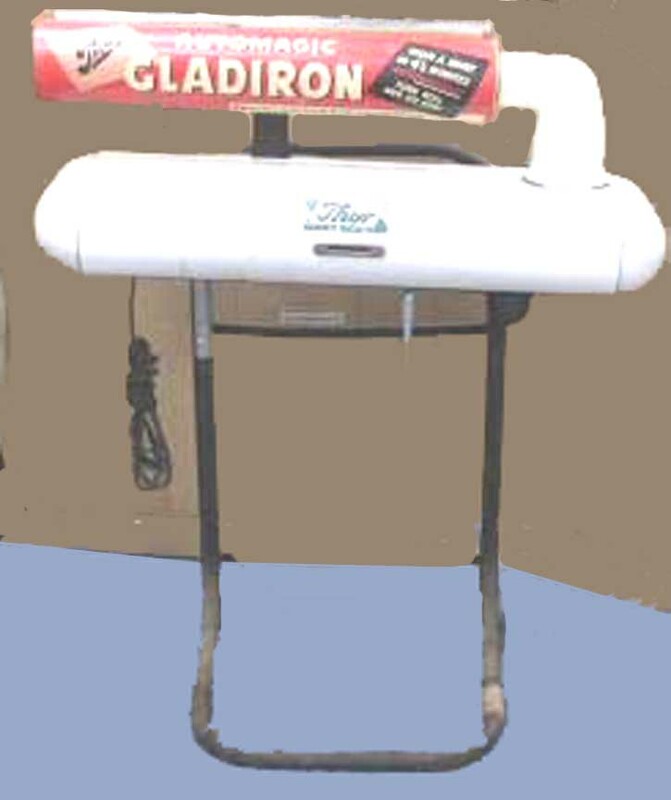 Thanks to Rita, one of our readers, we have a manual for the Gladiron. 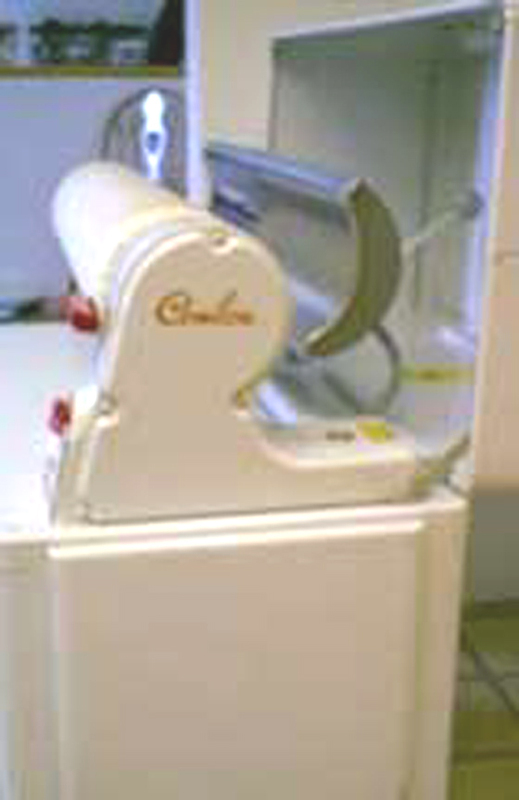 It is a ".pdf" that is about 6.6 MB; please contact us if you want a free copy of the Gladiron Manual. 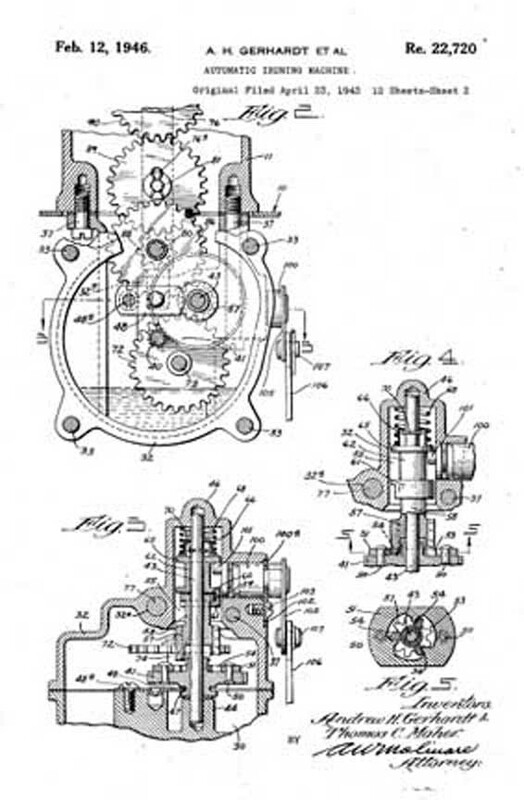 Patent RE22,720 has 24 pages -- and that can be a hassle to download. contact us if you want a 3.8MB zip file containing images of all 24 pages. 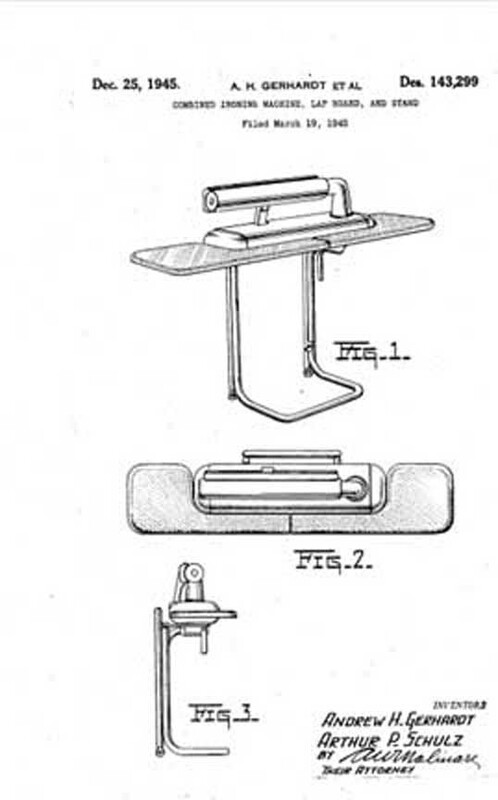 There are 12 pages of drawings and 12 pages of explanatory text. 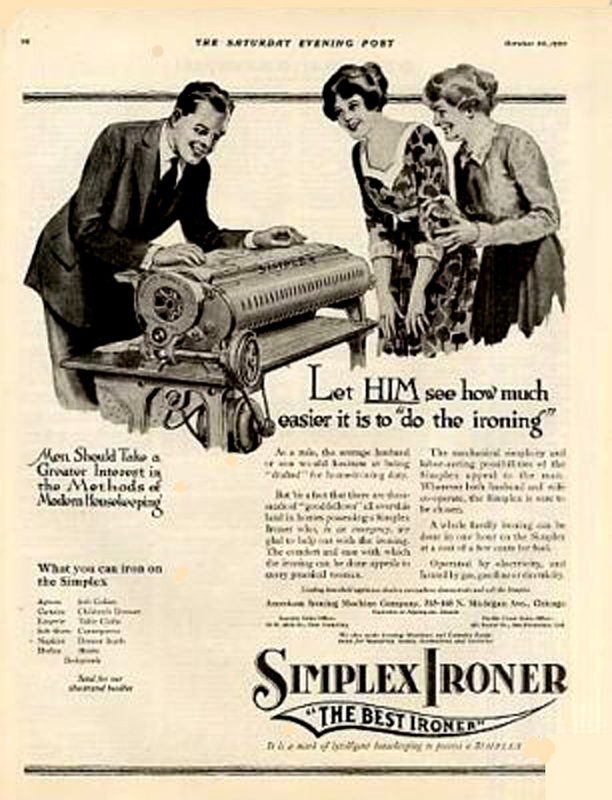 Beginning in 1905, he Simplex Ironer was made by the Peter Brothers Manufacturing Company. 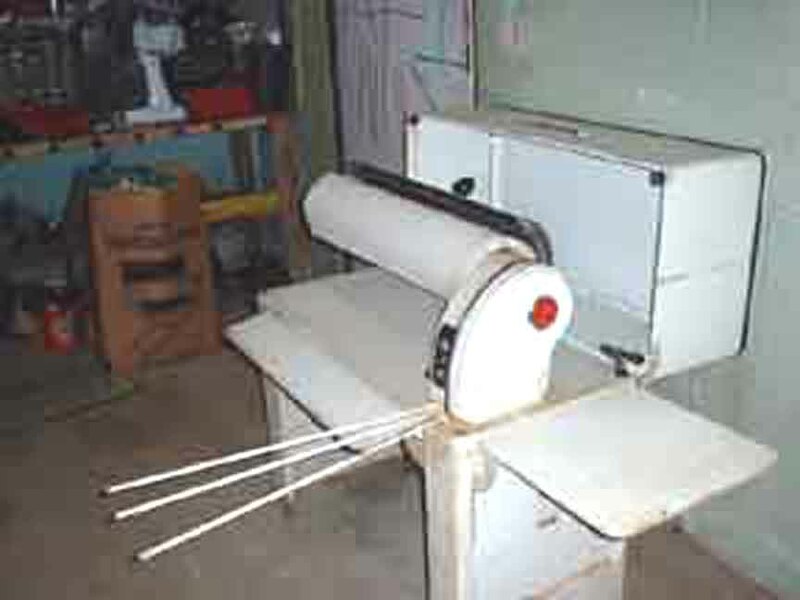 The organization specialized in producing laundry ironers. 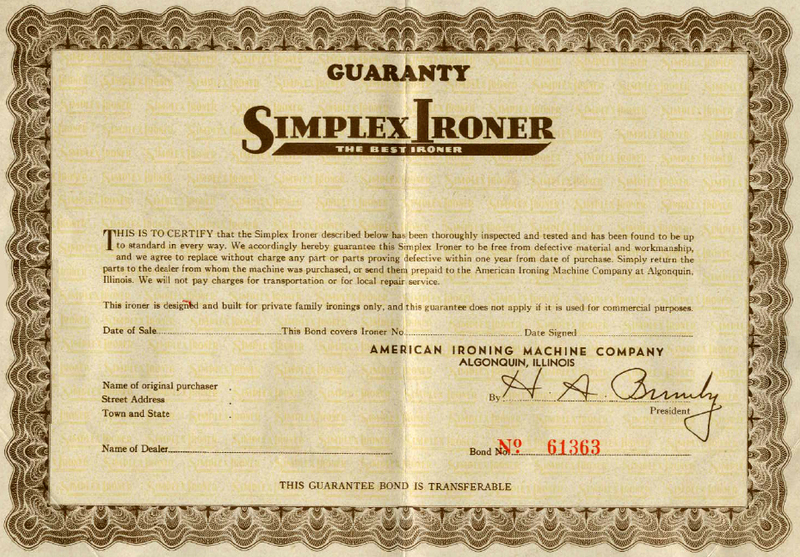 The Company employed 200 people and produced 2,500 ironers per month. 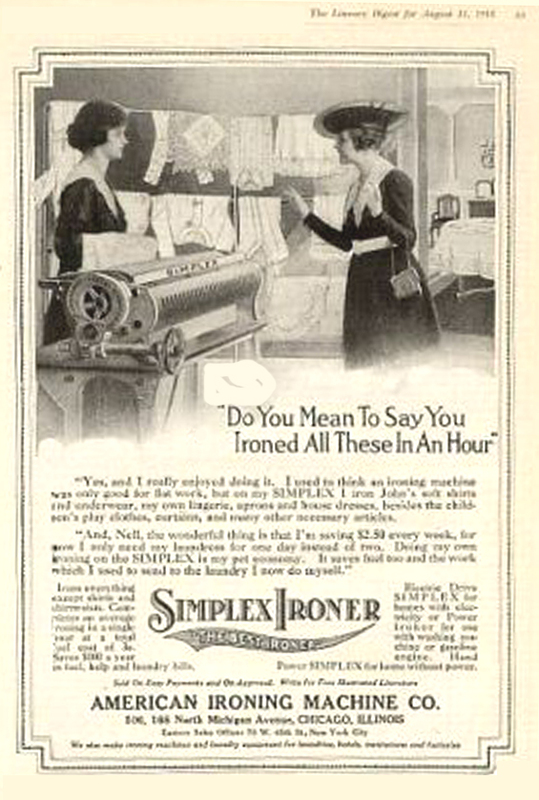 In 1920 Peter Brothers Manufacturing changed their name to American Ironing Machine Company. 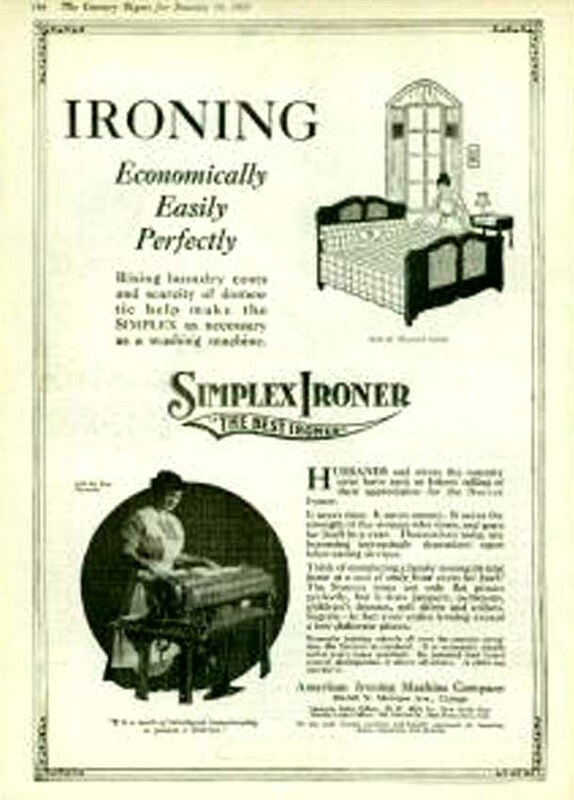 Simplex Ads targeted at "more lesiure time"
Simplex Ads targeted at "Family Values"
From 1905 to 1929, the company engaged in massive advertising, buying full-page ads in upscale publications, such as The Literary Digest,The Saturday Evening Post and The Country Gentleman. 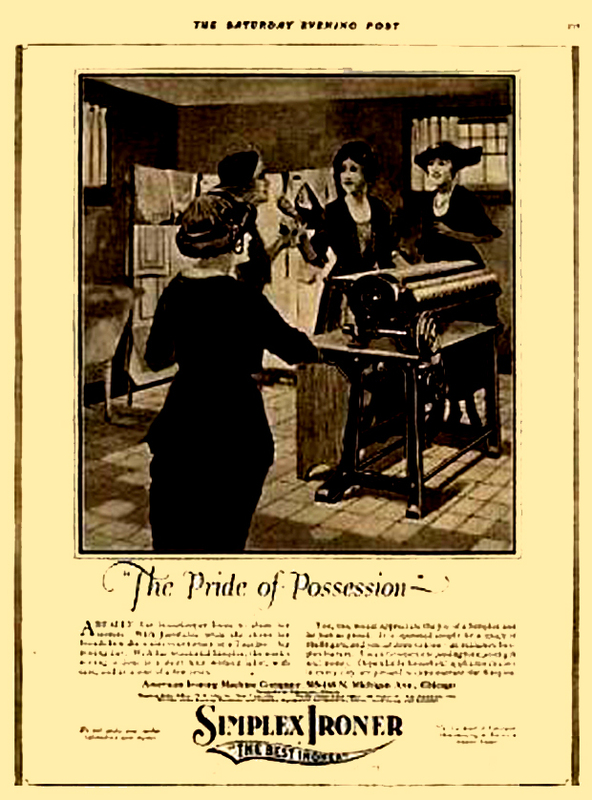 Simplex Ads targeted at "Pride of Posession"
As the 1920s progressed, "Status" or "Pride of Possession" also entered the advertisng copy. 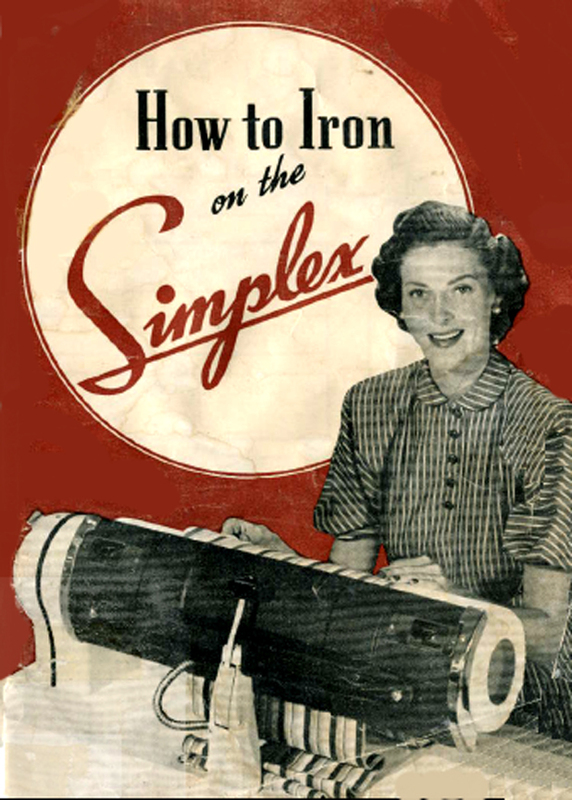 Thanks to our friend and reader Don H. of Palm Desert, California, we have a complete Simpex operator's manual for this very early model. Write Us and we'll be glad to send you a ".pdf" of the manual for FREE. 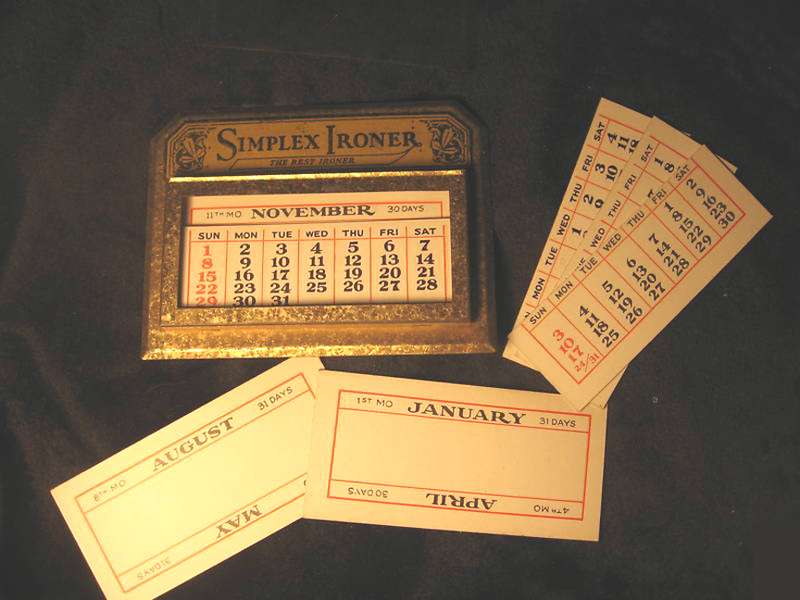 Here are photos of a "Modern" Simplex. They were sent by our friend Sharon from West Virginia! 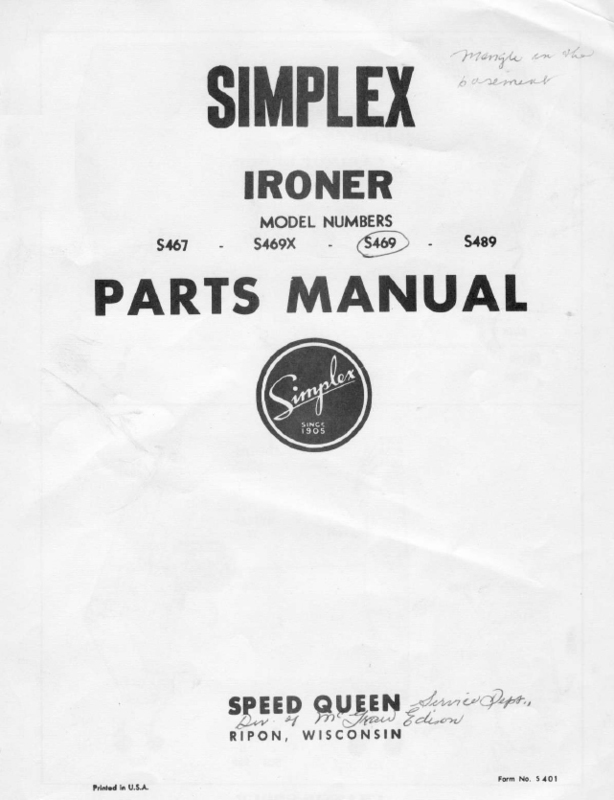 If you take a close look at the "Parts List" cover above, you'll note that Simplex had been taken over by McGraw-Edison, the manufacturers of the Speed Queen line of appliances. 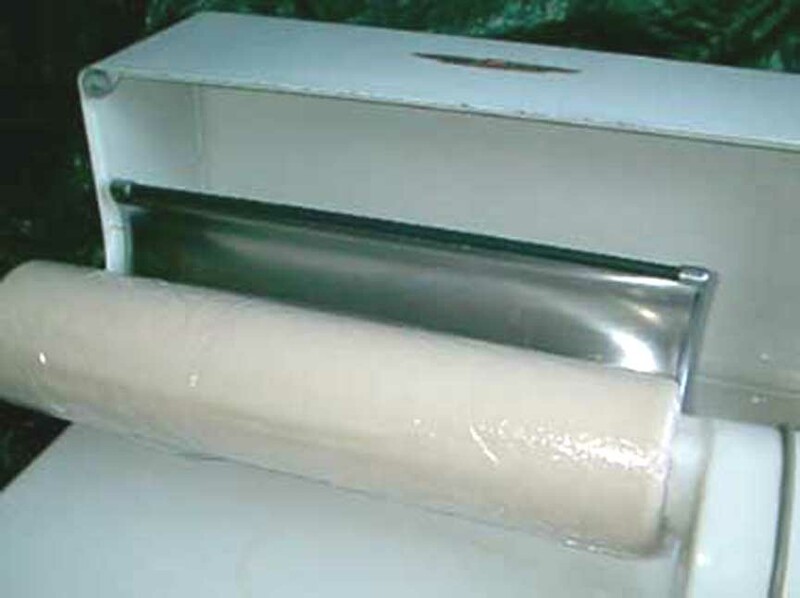 We siscuss this latter brand next. 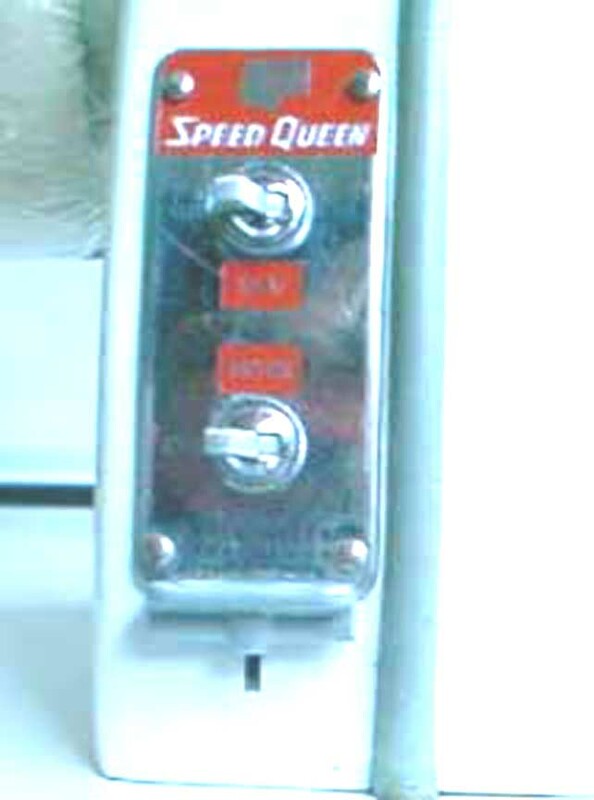 "...HELLO HERE OF SOME PICTURES OF MY SPEED QUEEN MANGLER THAT WORKS ABSOLUTELY PERFECT AND HAS NEVER BEEN USED!! 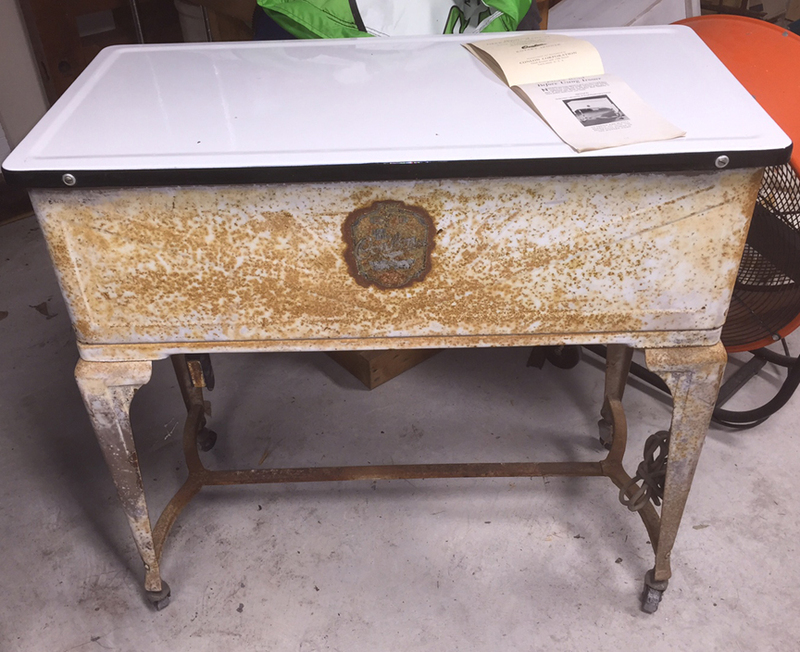 !...IT HAS AN ORIGINAL GENERAL MOTORS PACKARD MOTOR THAT RUNS SILENT AND LIKE NEW AS WELL .....THIS MANGLE IS ALL ORIGINAL!! !.....I PURCHASED THIS ITEM FOR $1.00 AT THE LOCAL GOODWILL..."
If you are seeking to restore a Speed Queen ironer )or just learn how to operate one), you would probably benefit from some of the material on the modern Simplex (above), since they were made by the same company. 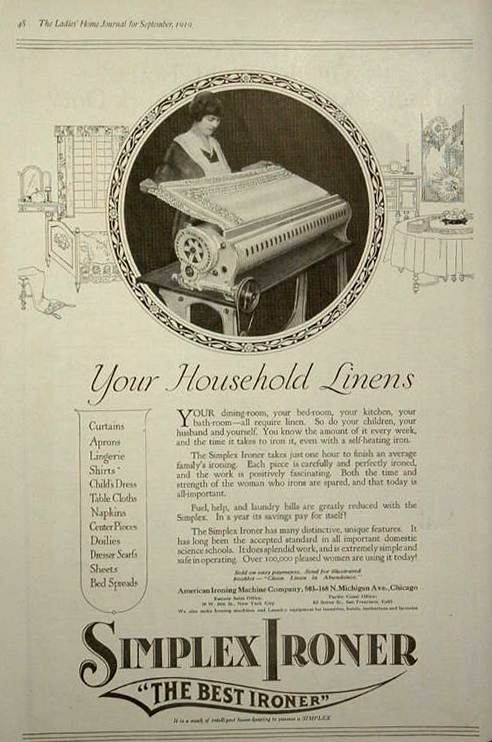 General Electric made its entry into the home ironer business with a flat plate device. 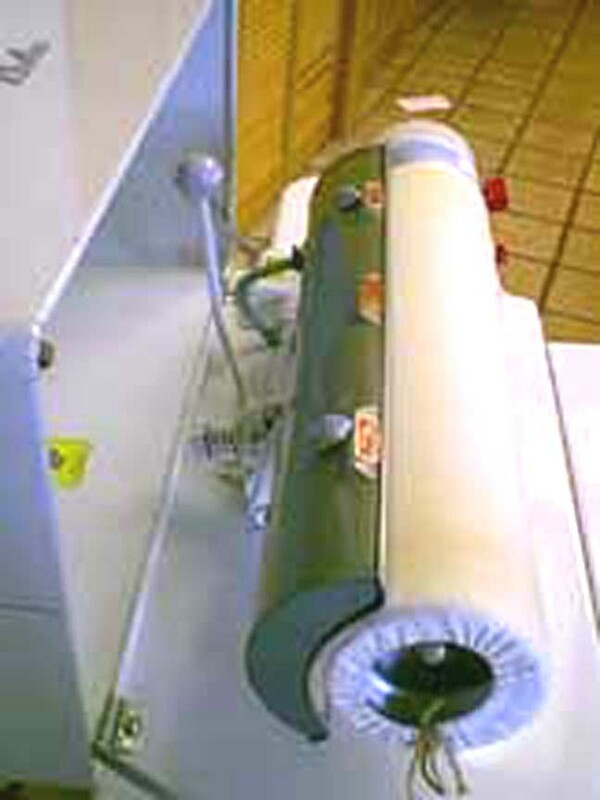 From a manufacturing point of view, this is a lot simpler and cheaper because it does not have the gears, pulleys and wires that run the roll mechanism. 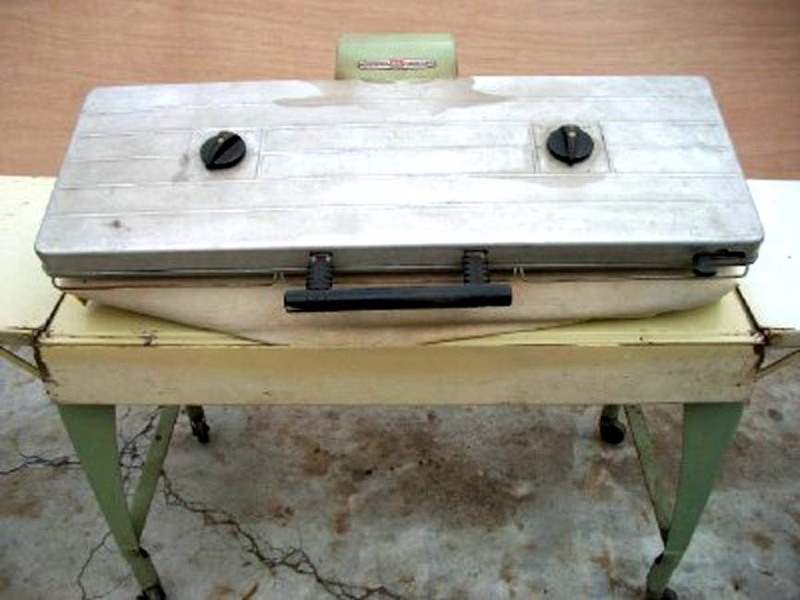 All you do is place the object on the hot plate and close the lid on top of it. This technique is limited to pieces that are small. 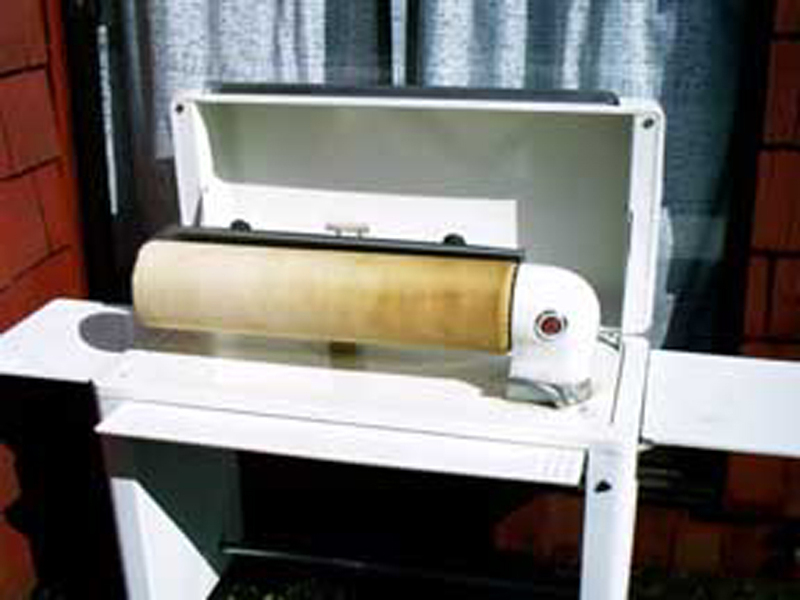 In the 1930s, General Electric gave up the flat-plate ironer and made a roller version that competed with the Ironrite. 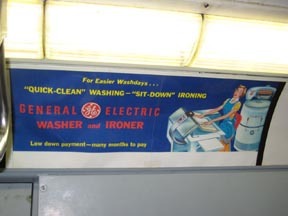 Here is an ad for the General Electric Ironer that was displayed on NYC Subway trains in the 1930s and 1940s. These photos were sent to us by our friend Lorena. 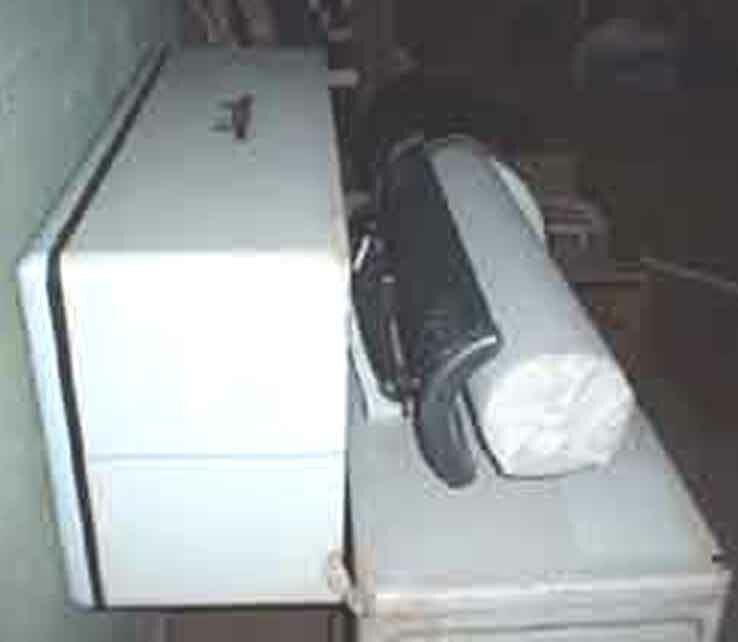 She has a "Universal" ironer that seems to have survived fairly well. 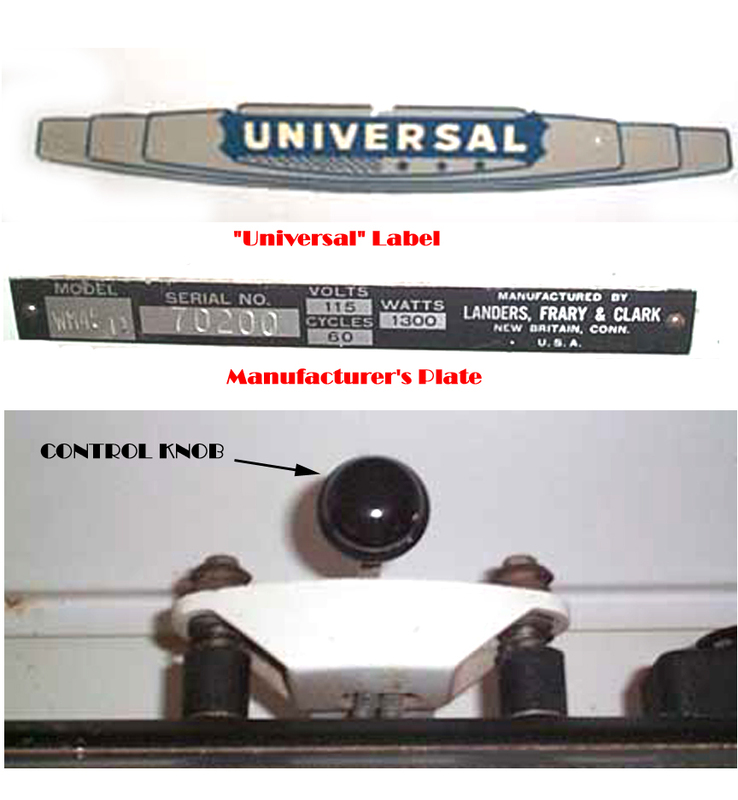 "Universal" was the name used for products made by Landers, Frary and Clark of Connecticut, and we have a detailed history of that company on our Coffee Page, largely because LF&C was catapulted to fame by manufacturing the first percolator. 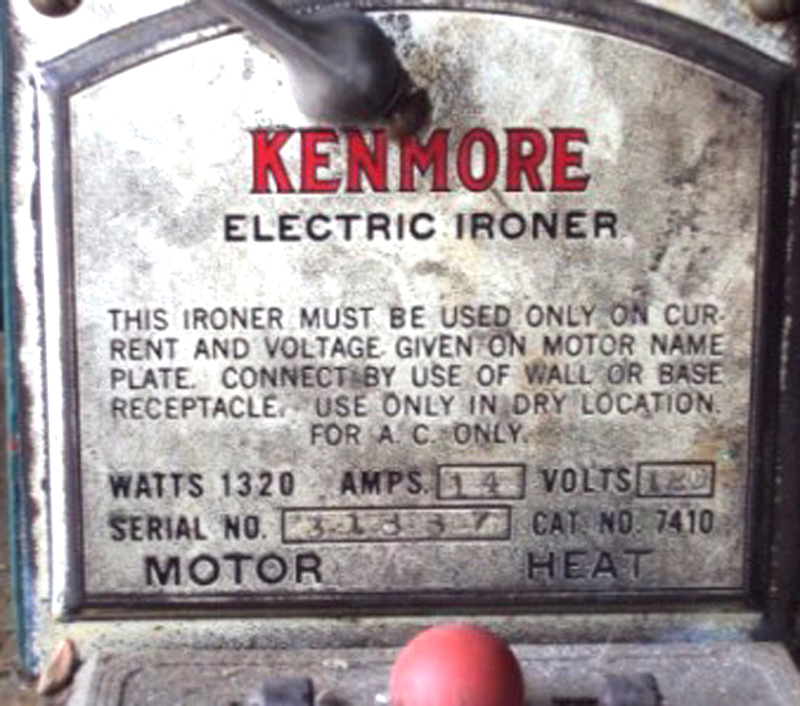 For those of you who are too young to remember when Sears was actually more than a dump, Kenmore was Sears' "House Brand". 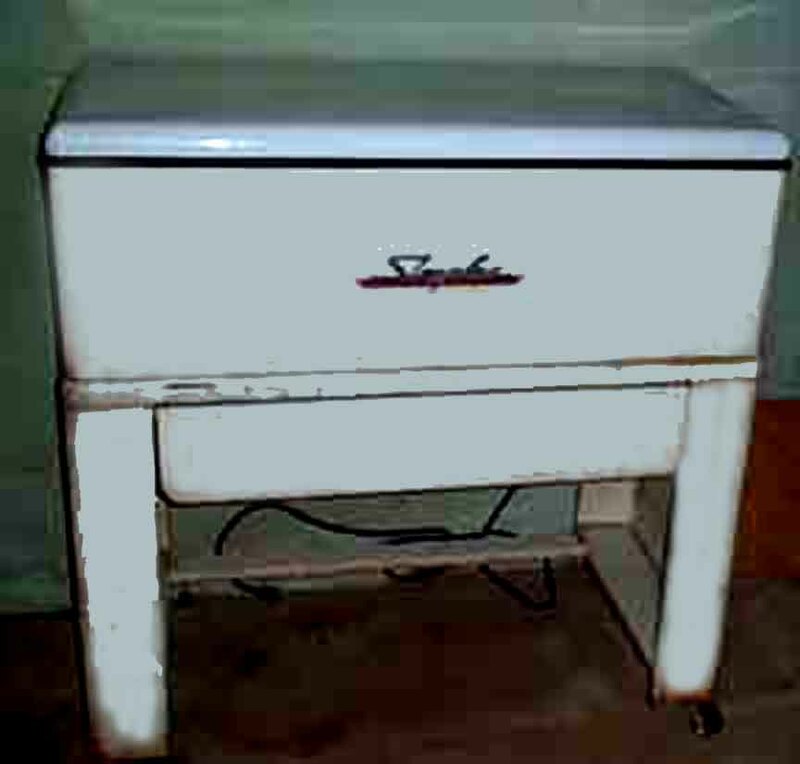 Sears contratcetd for the production of appliances by other "name" manufacturers. 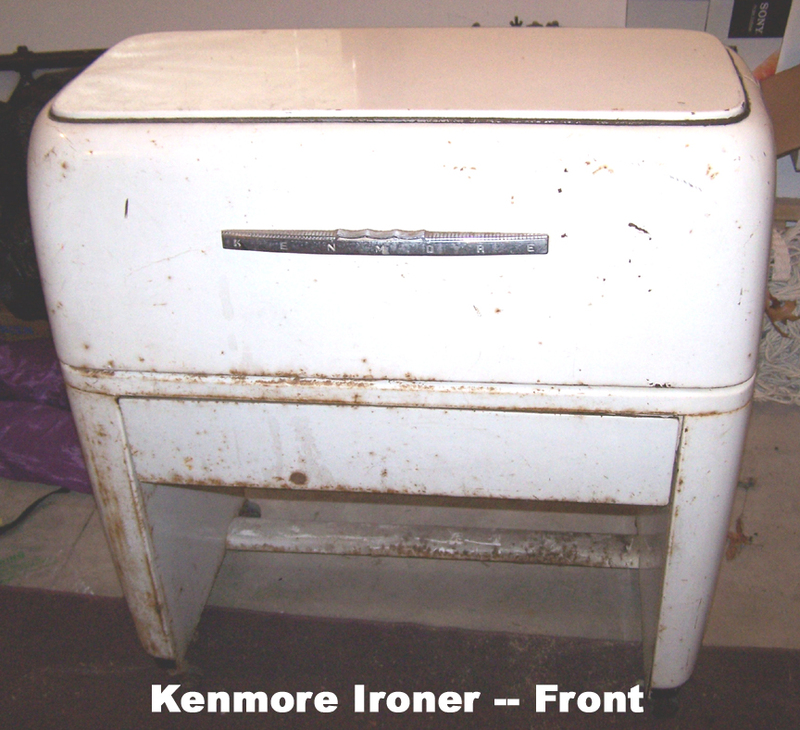 generally, the Kenmore brand was slightly different and slightly "cheaper." 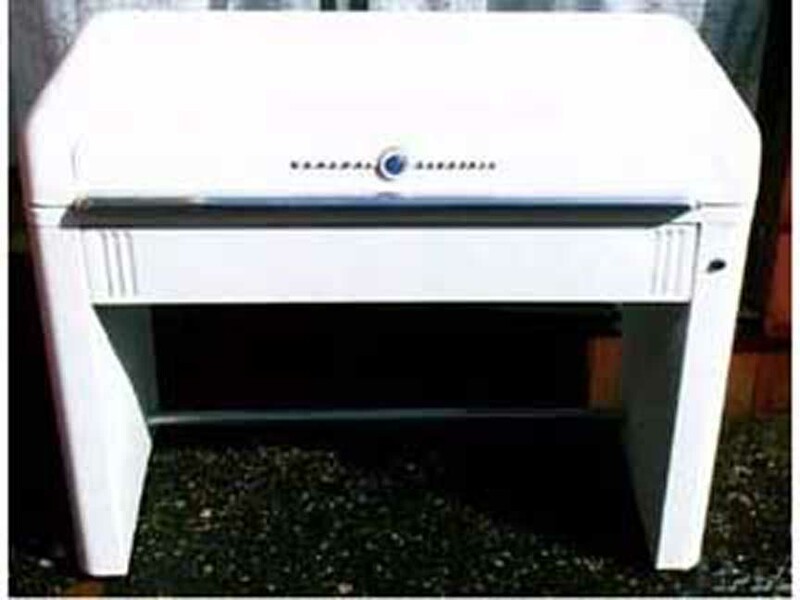 Usually, the companies so contracted were regional firms that were glad to get national business. 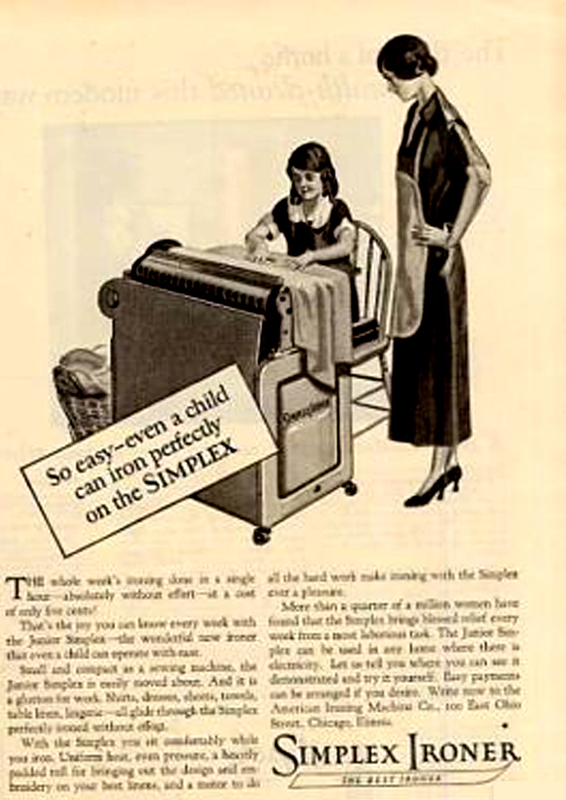 I "think" that the Kenmore Ironer was made by Simplex, but I could be mistaken there. "... 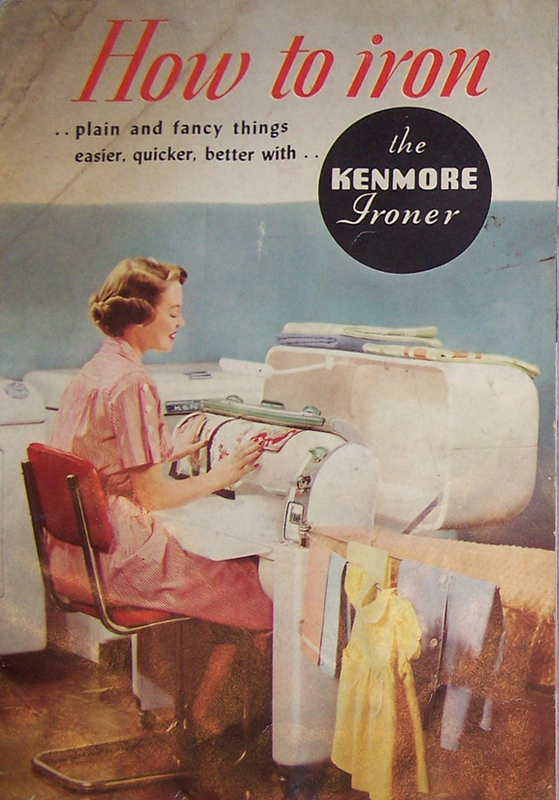 I have a 1952 Kenmore Ironer with the manuals. My Grandfather bought it for my Grandmother in the 1950s. 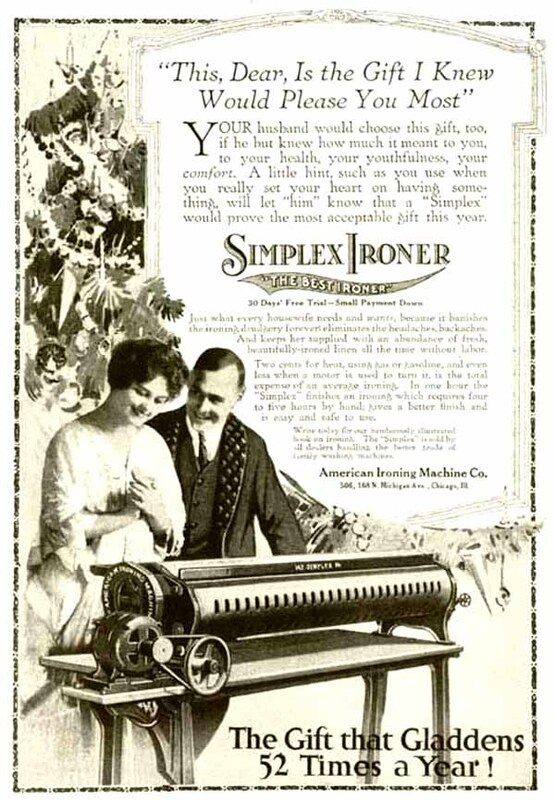 She used it to iron his suits because he was a door to door insurance salesman..."
Pam also has promised to scan the manual and the parts list. Check back with the site to see when I have received them. 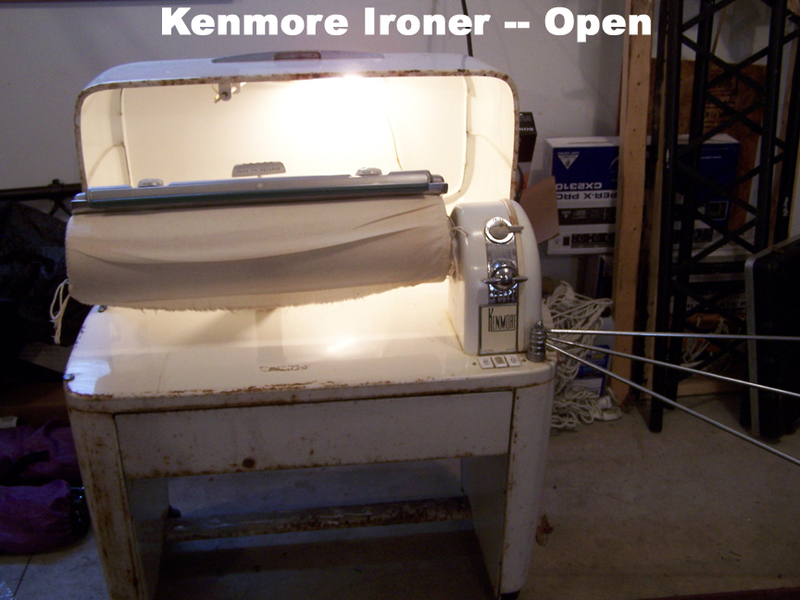 Pam has also provided a little quicktime movie of the Kenmore Ironer. Click here to view it.